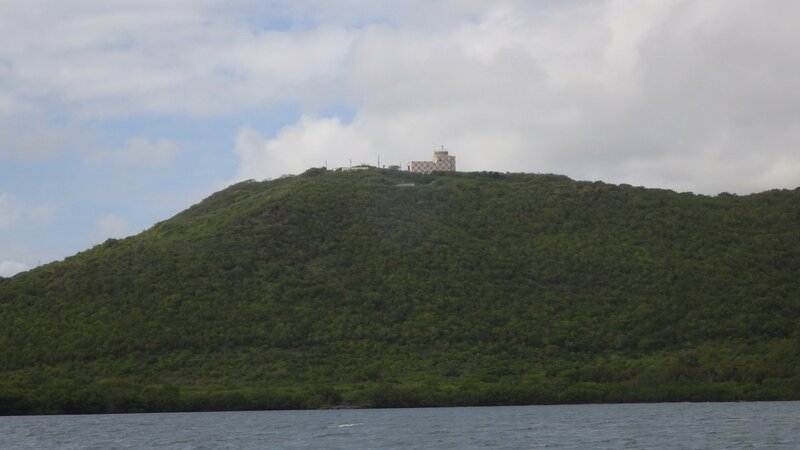 Spanish Virgin Islands are considered pert of Puerto Rico territory. 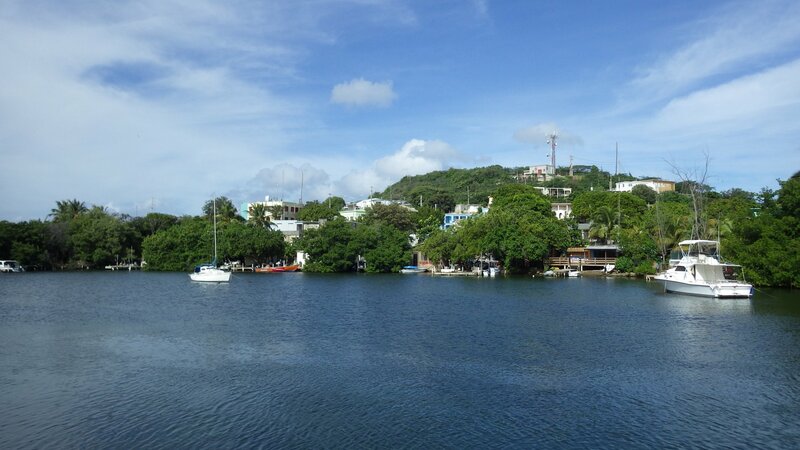 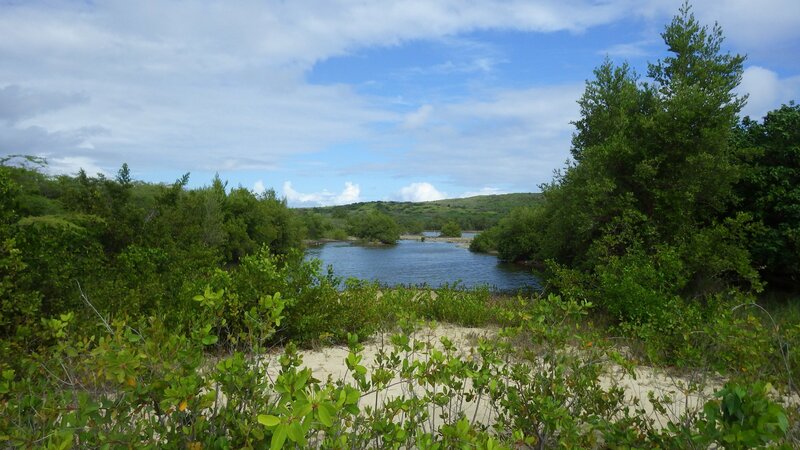 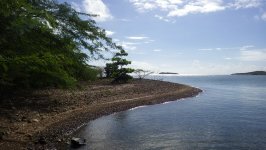 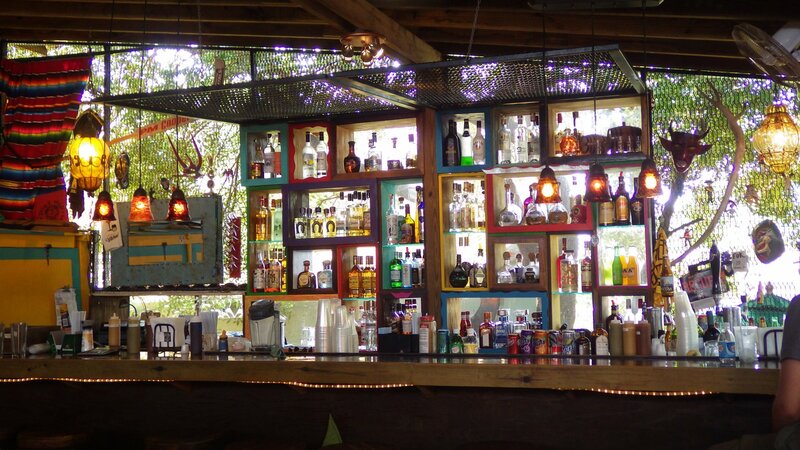 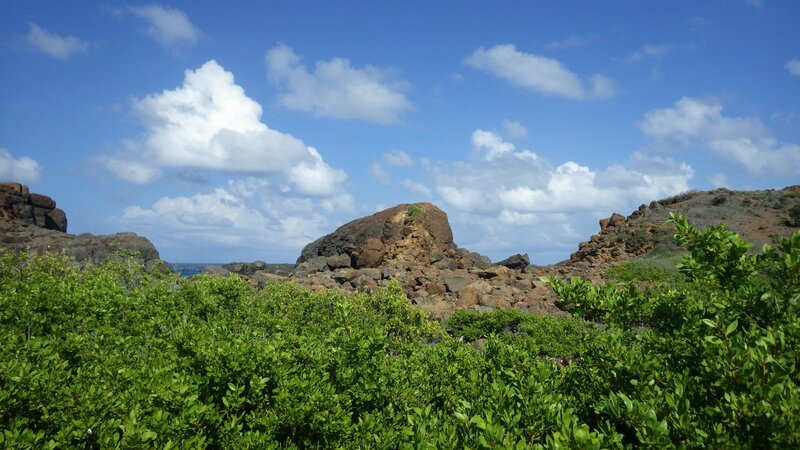 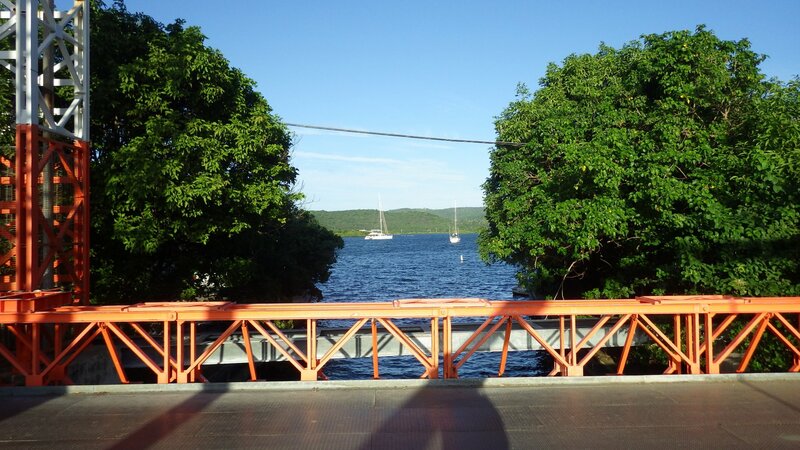 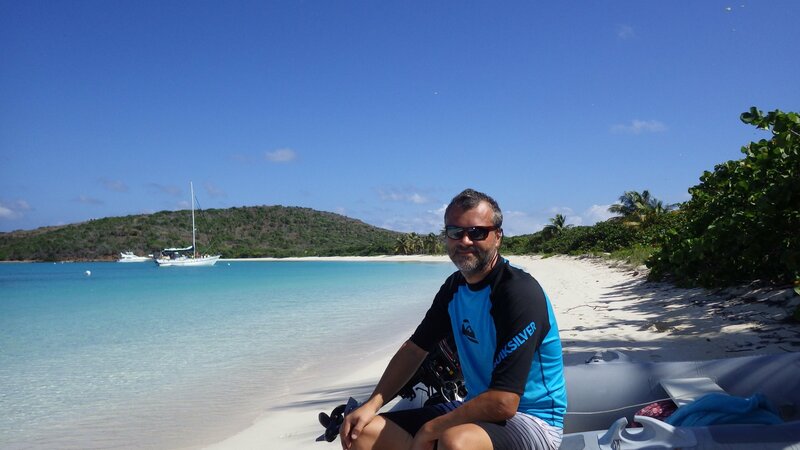 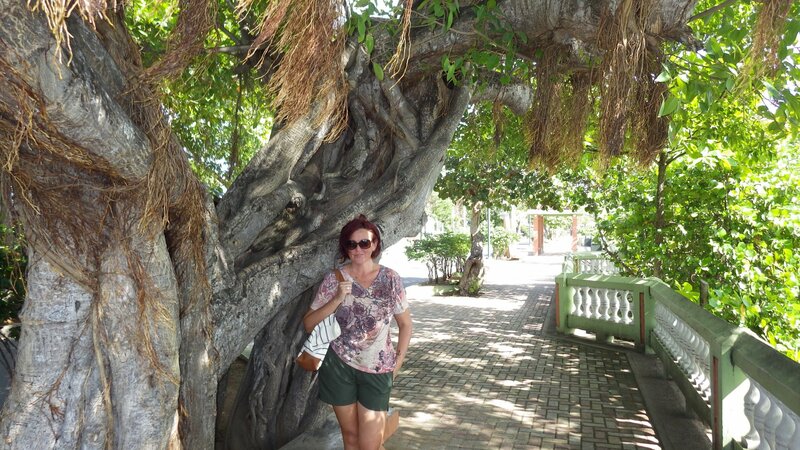 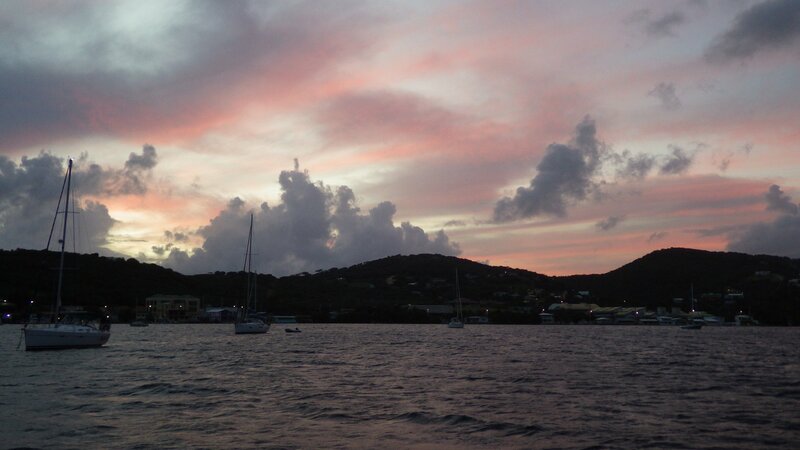 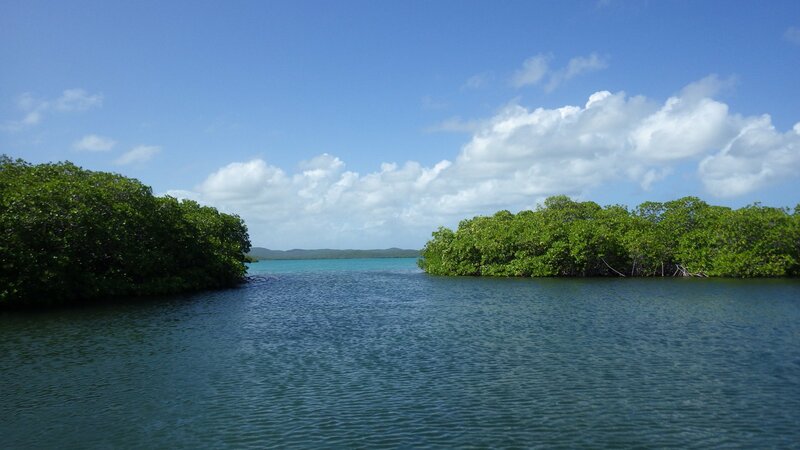 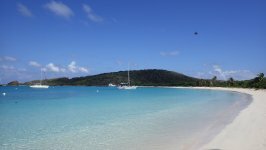 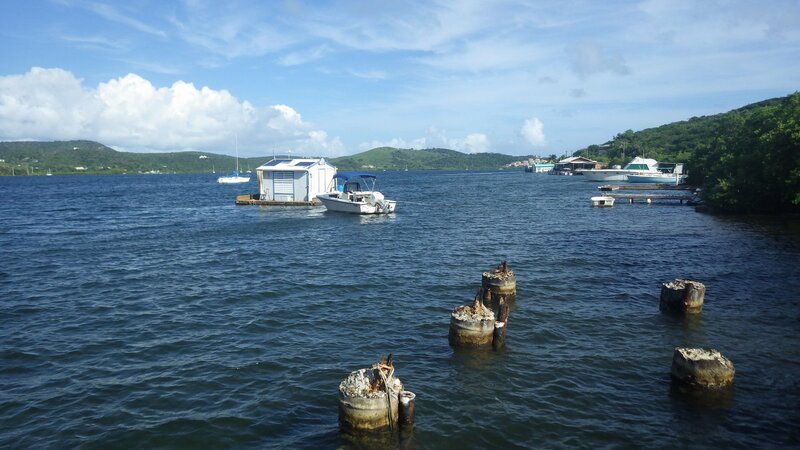 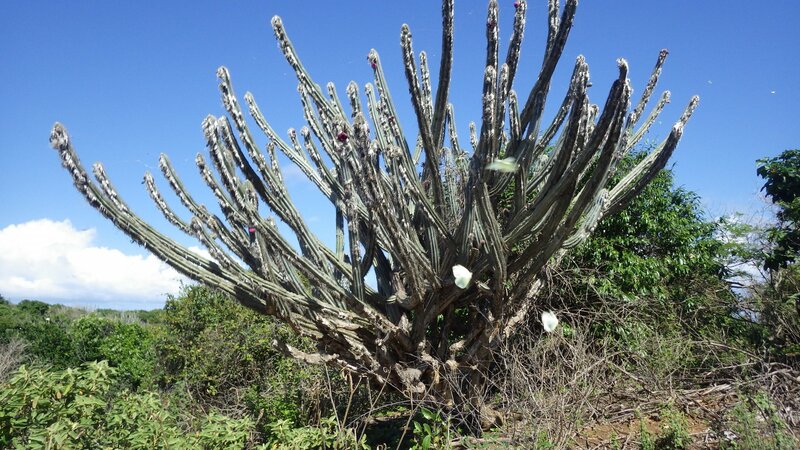 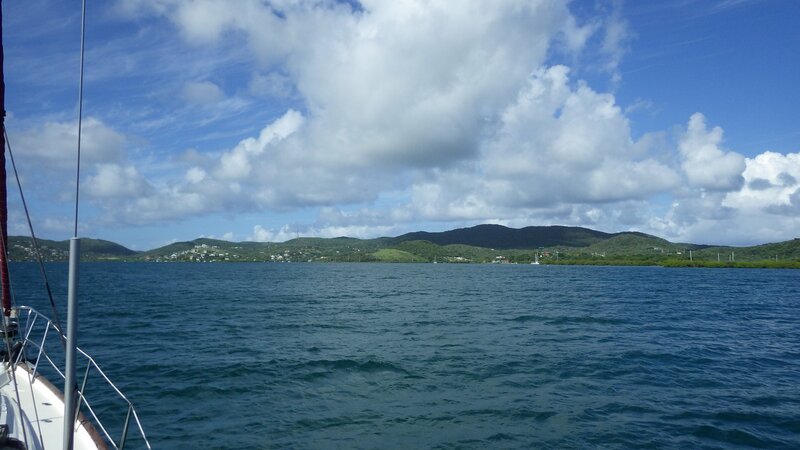 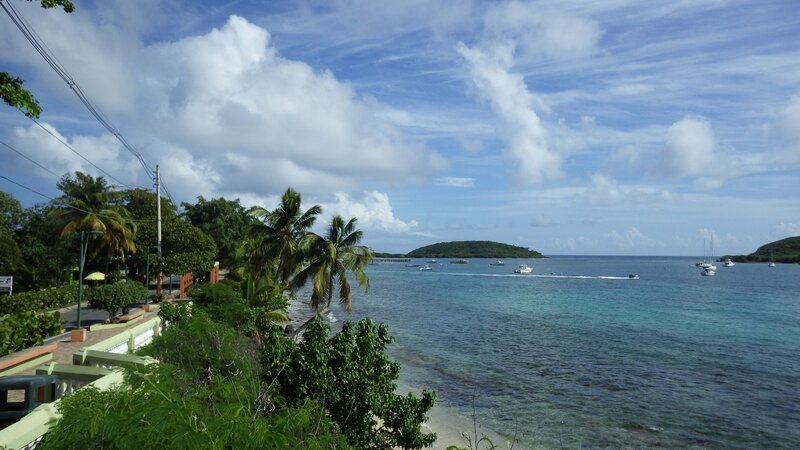 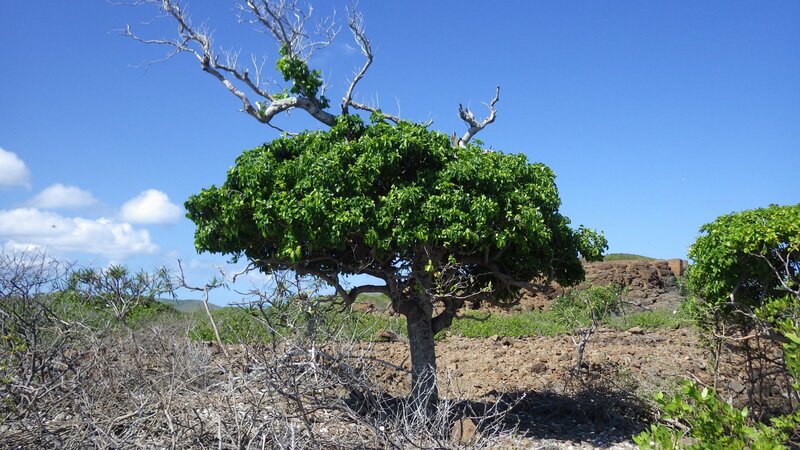 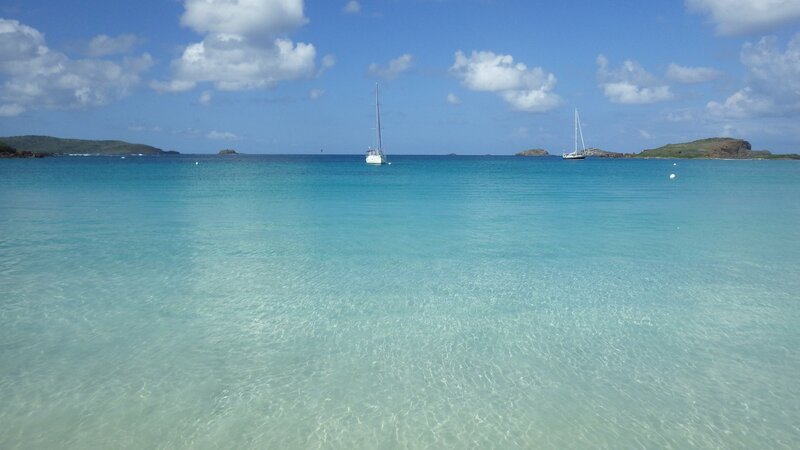 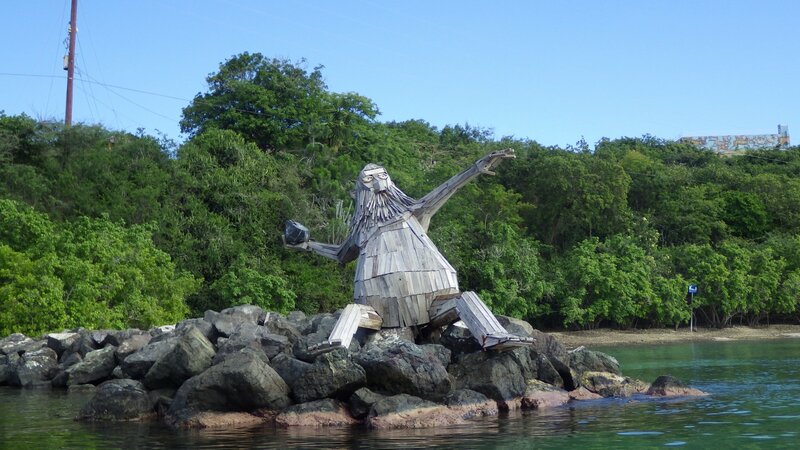 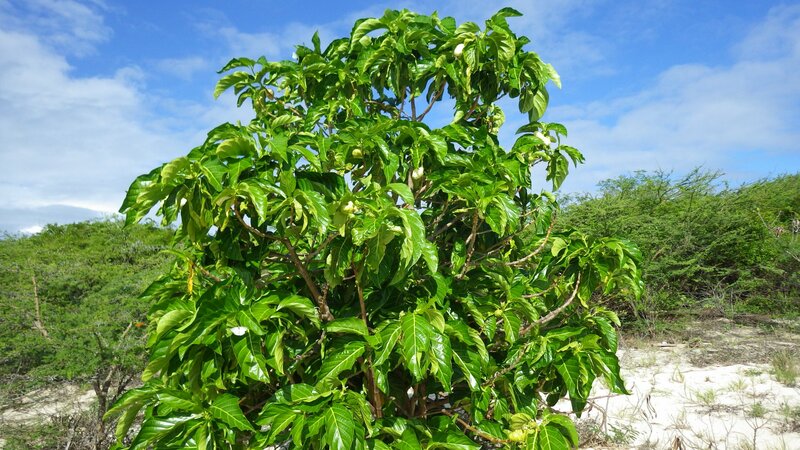 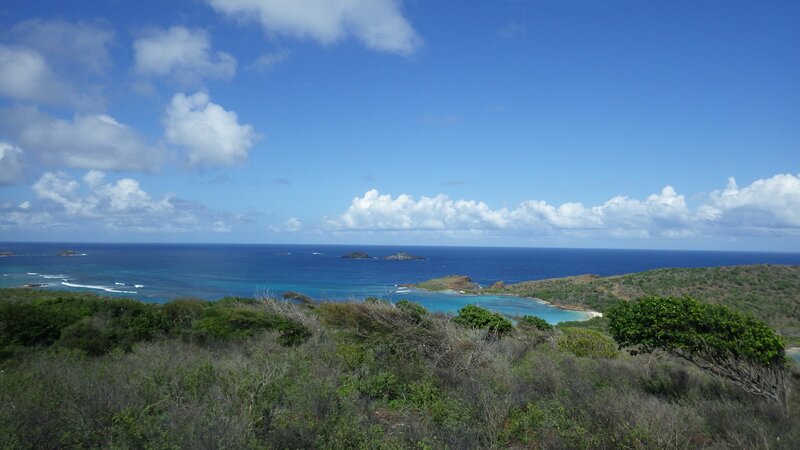 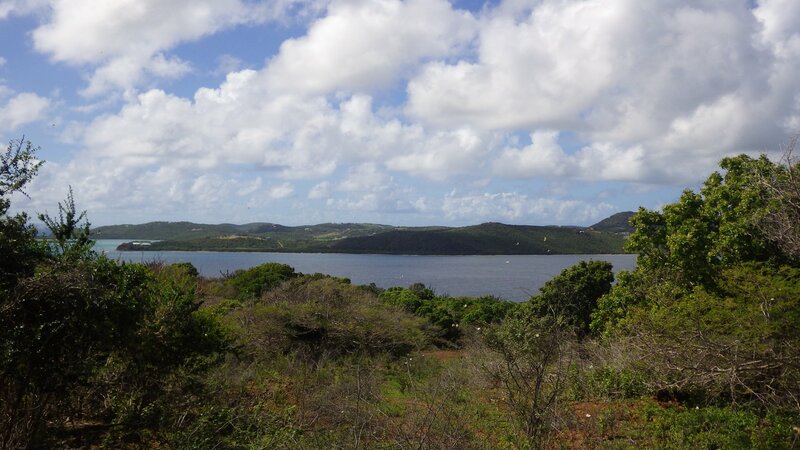 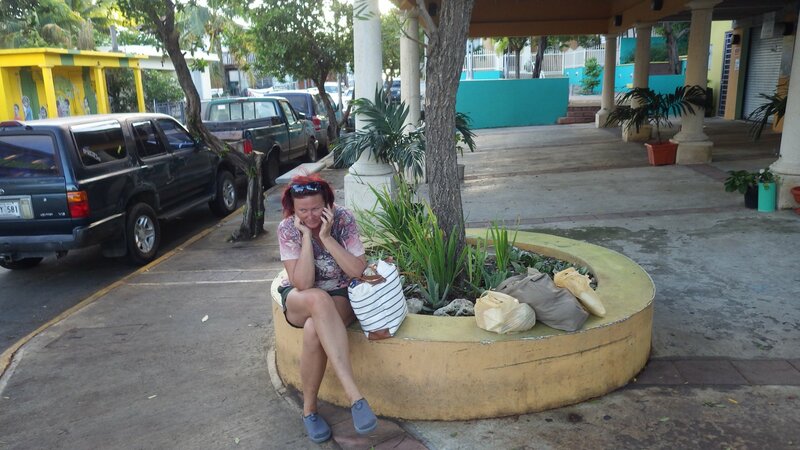 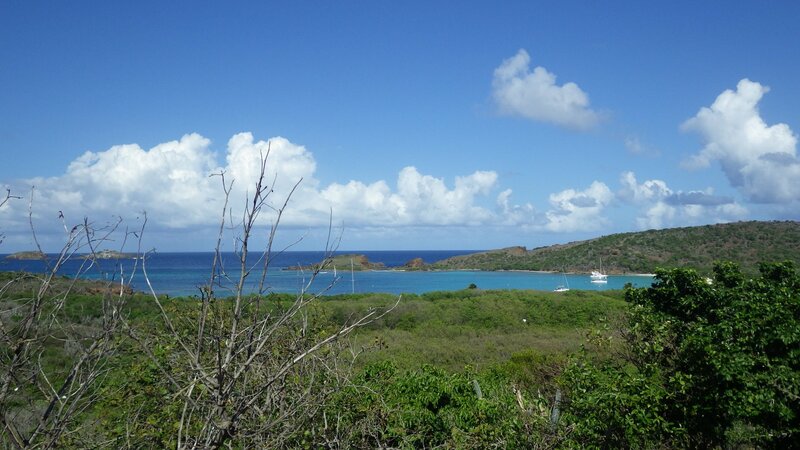 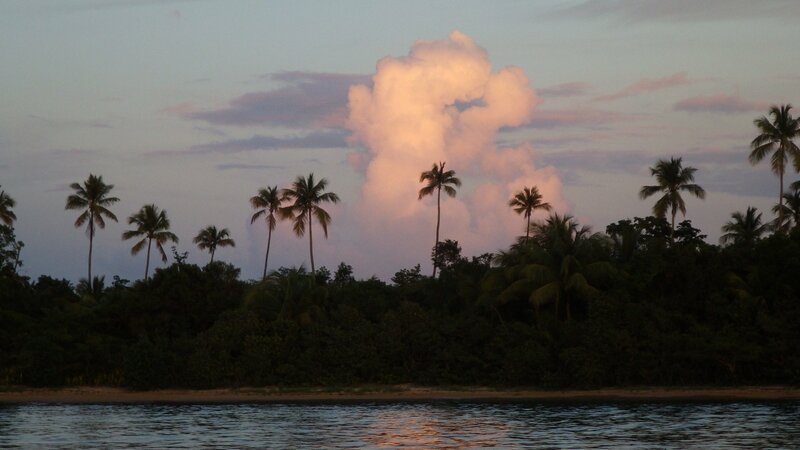 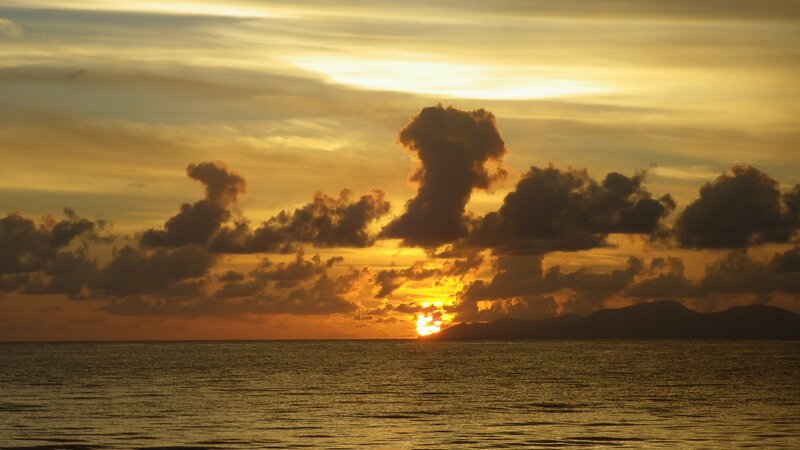 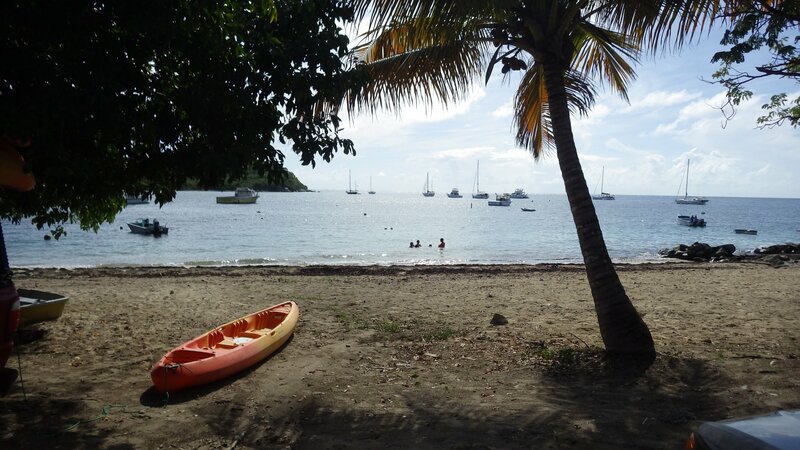 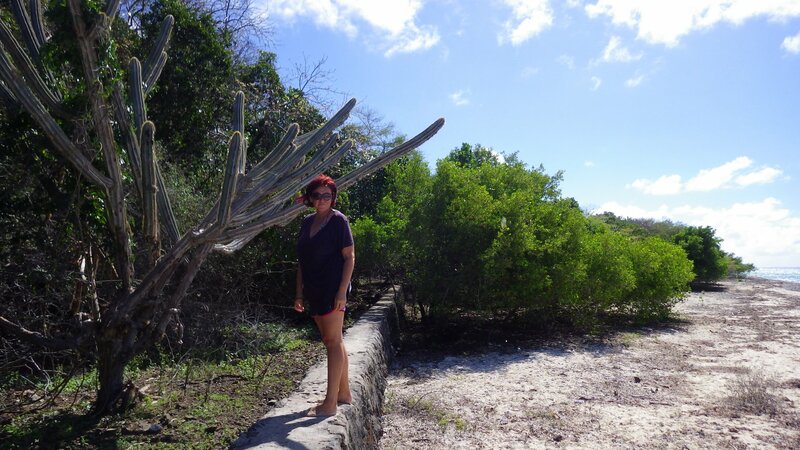 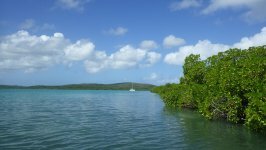 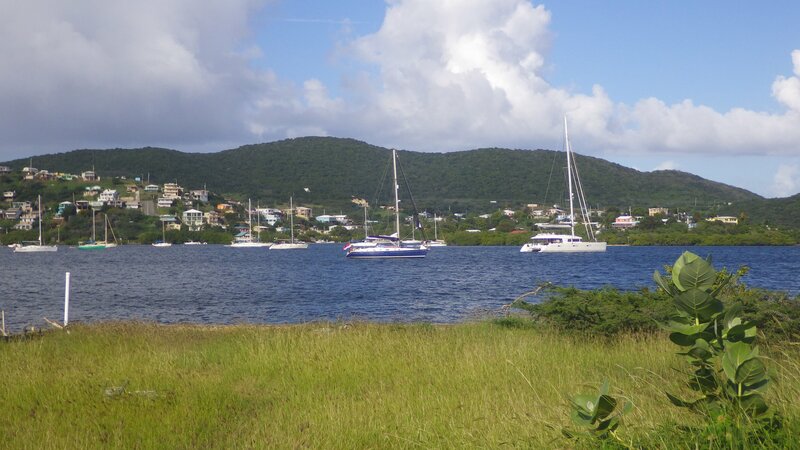 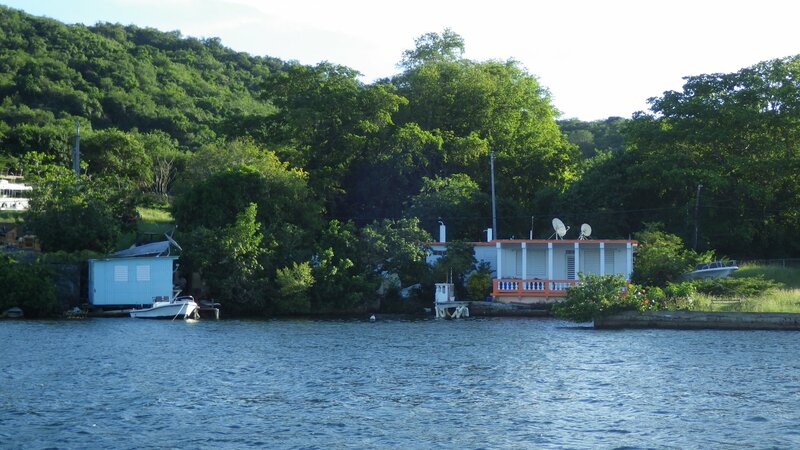 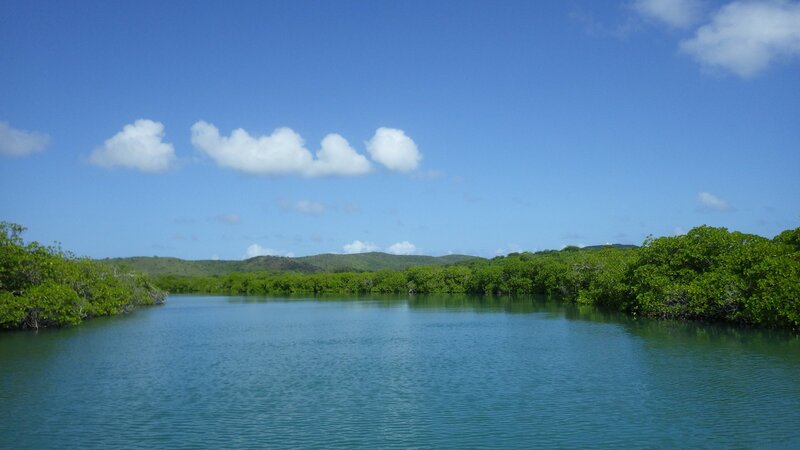 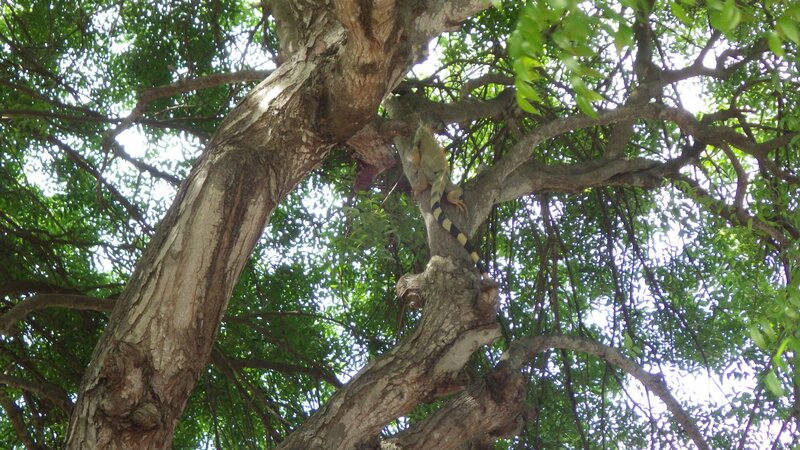 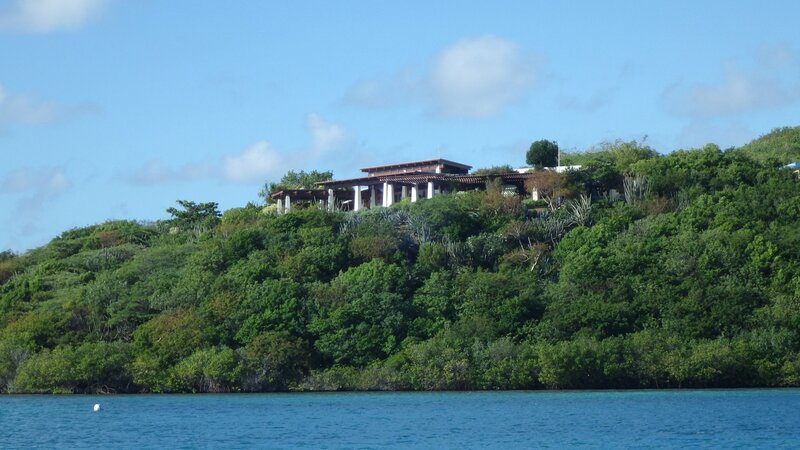 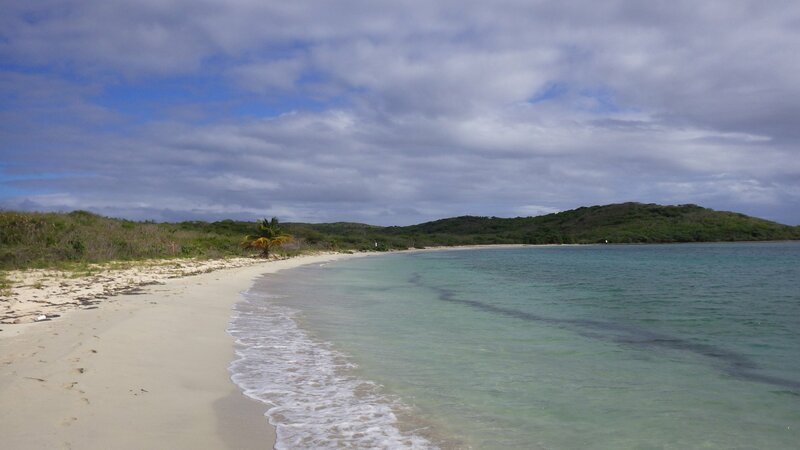 They consist of two major islands - Vieques and Culebra � as well as many smaller islets. 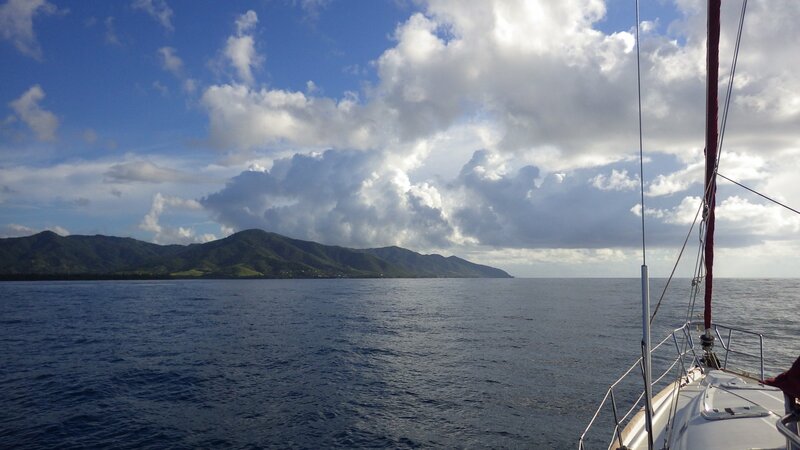 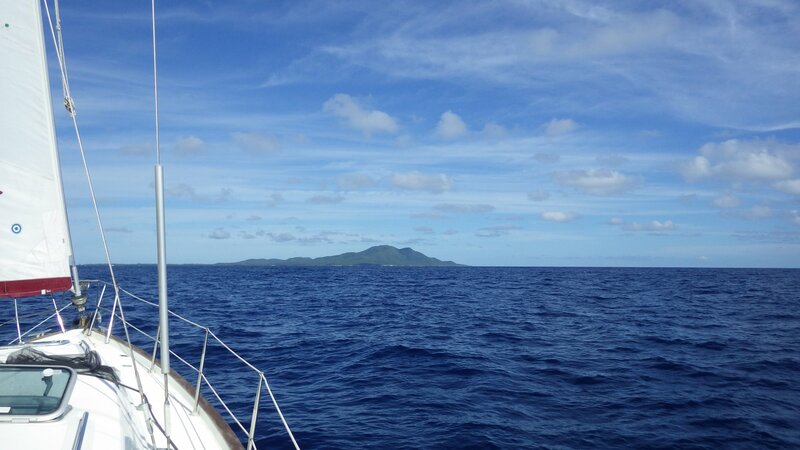 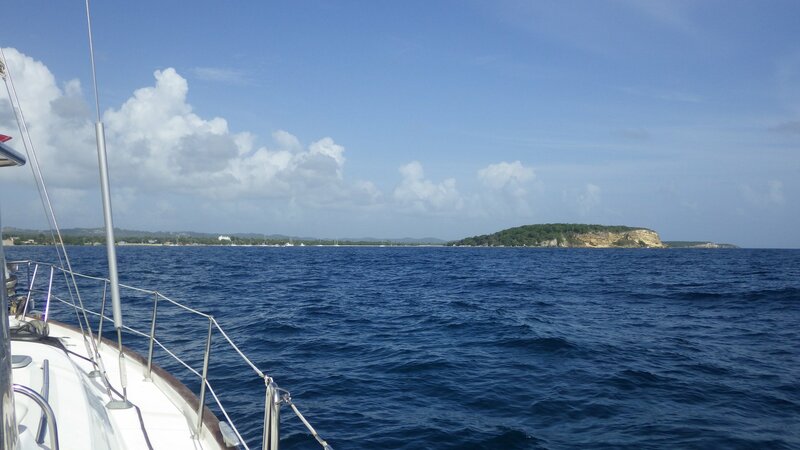 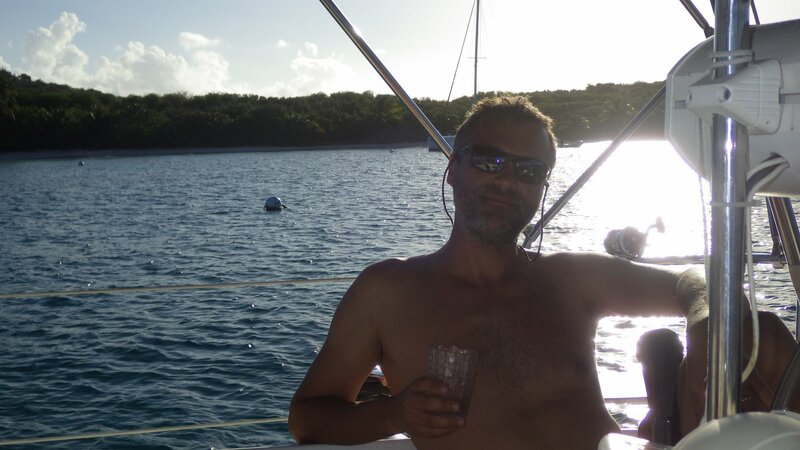 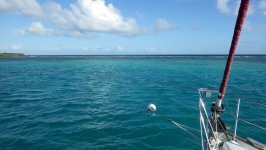 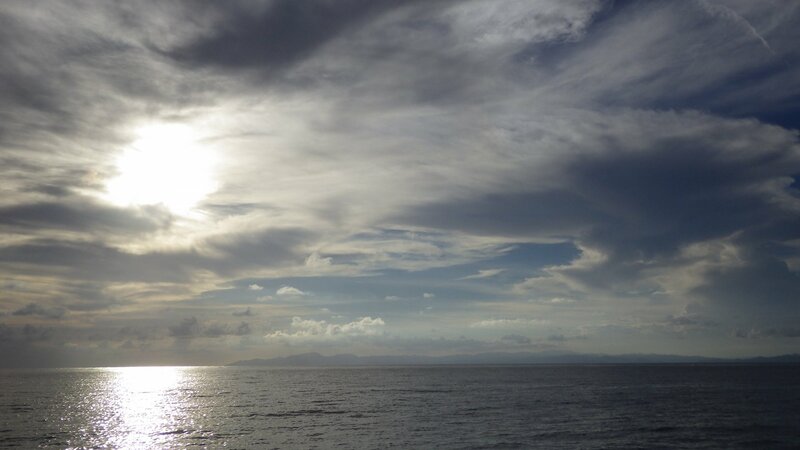 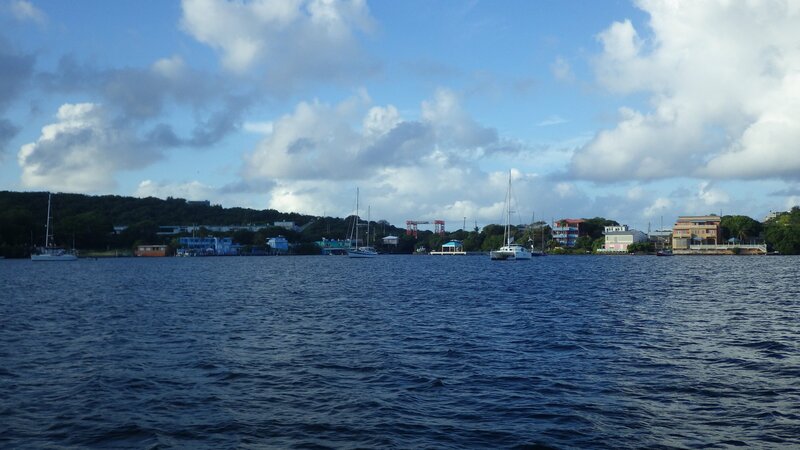 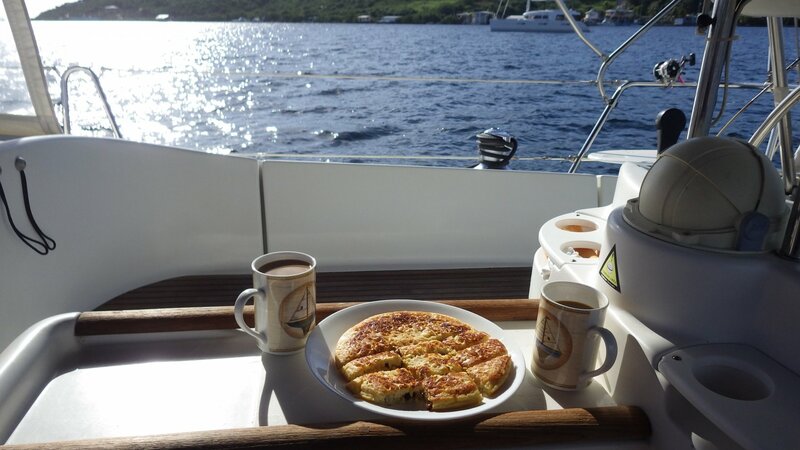 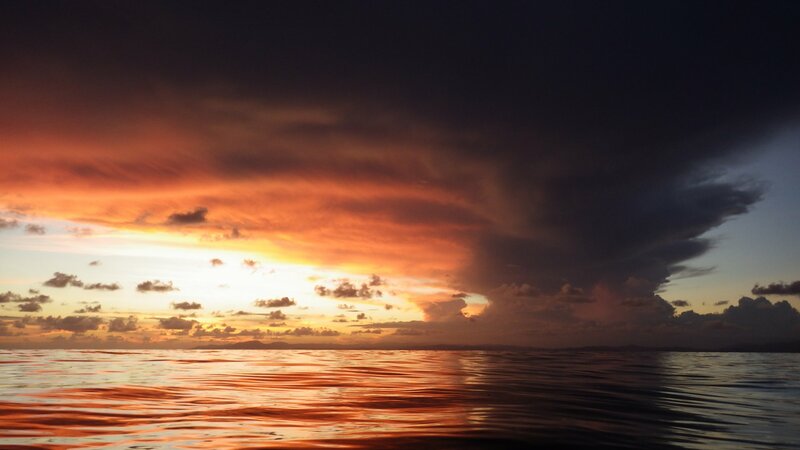 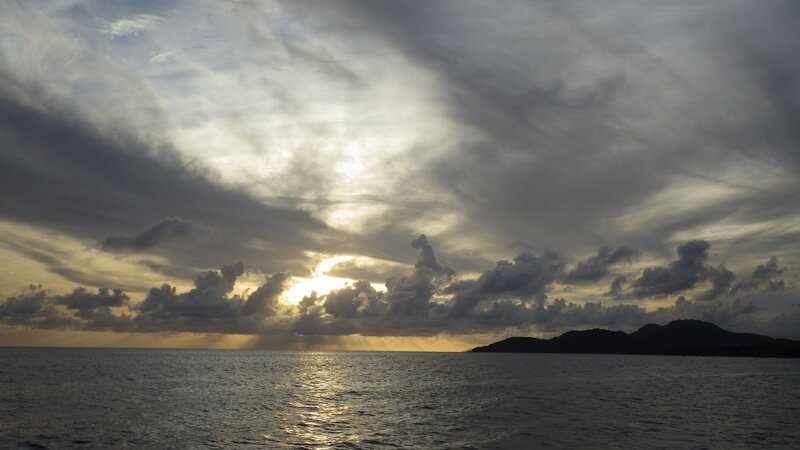 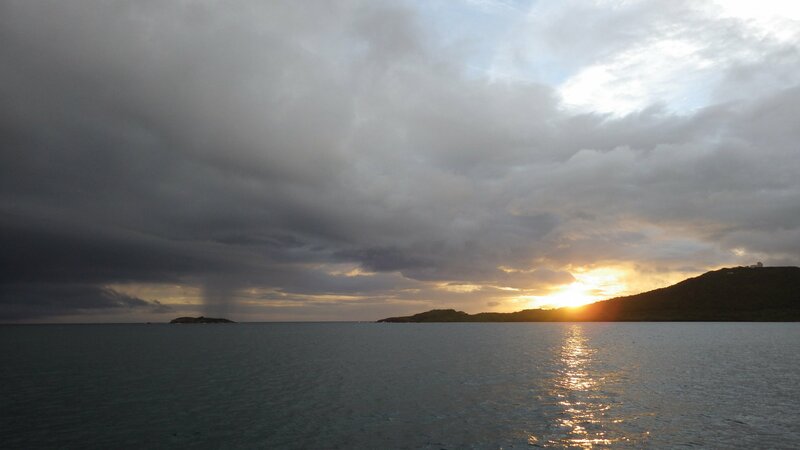 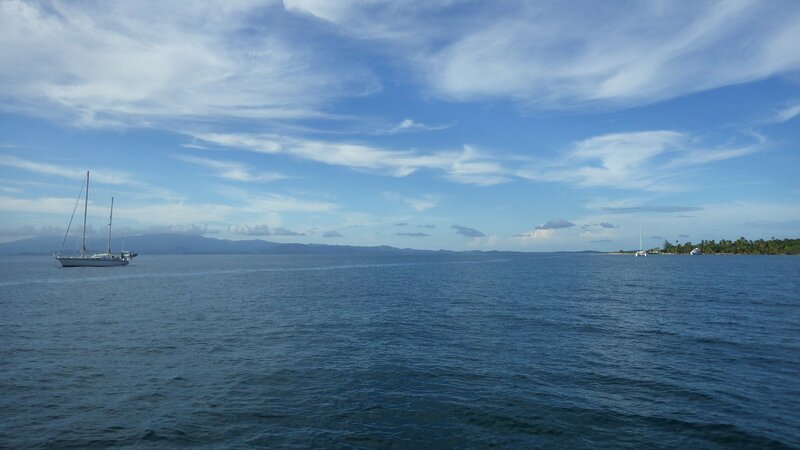 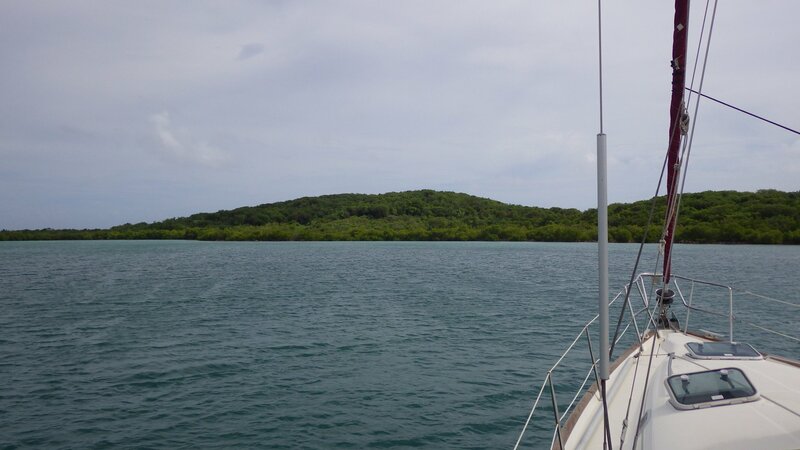 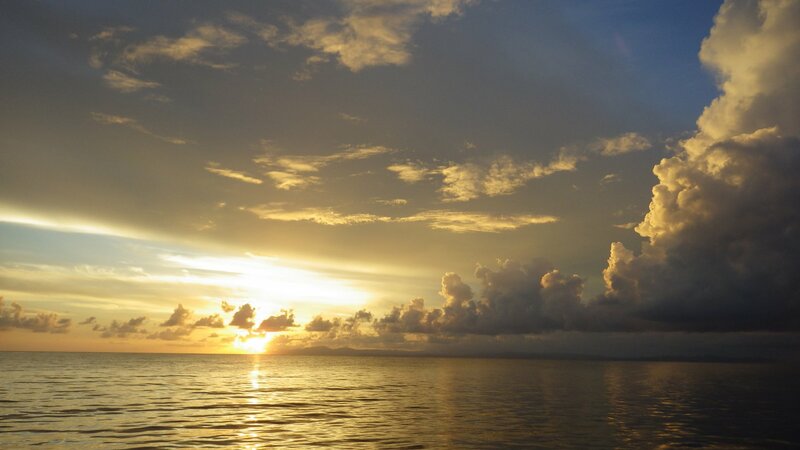 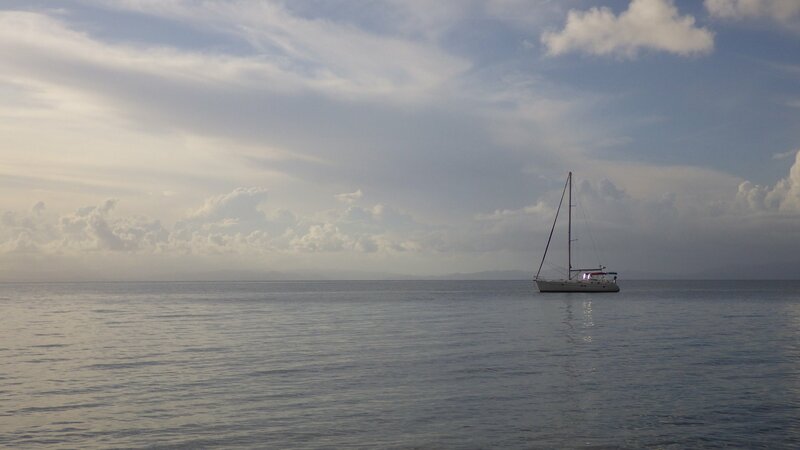 Sailing to Vieques Island at 4 knots, we had nice weather, with soft ESE winds and calm seas. 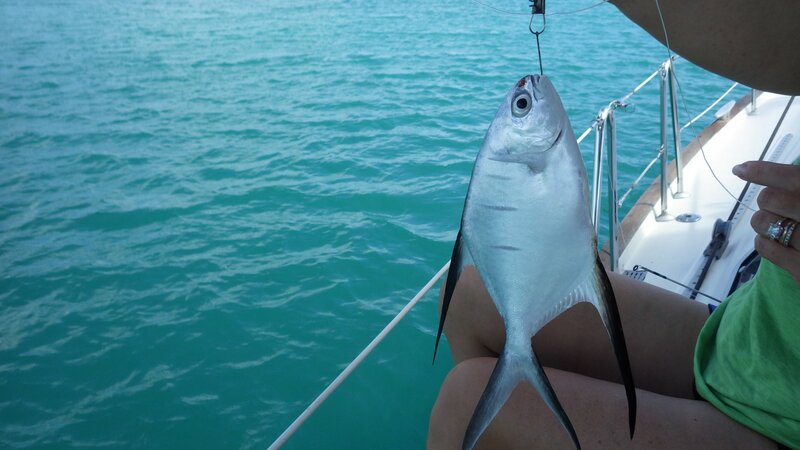 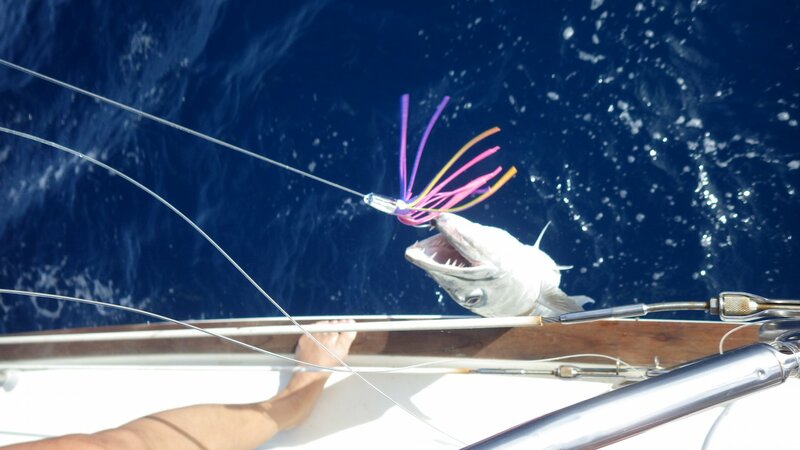 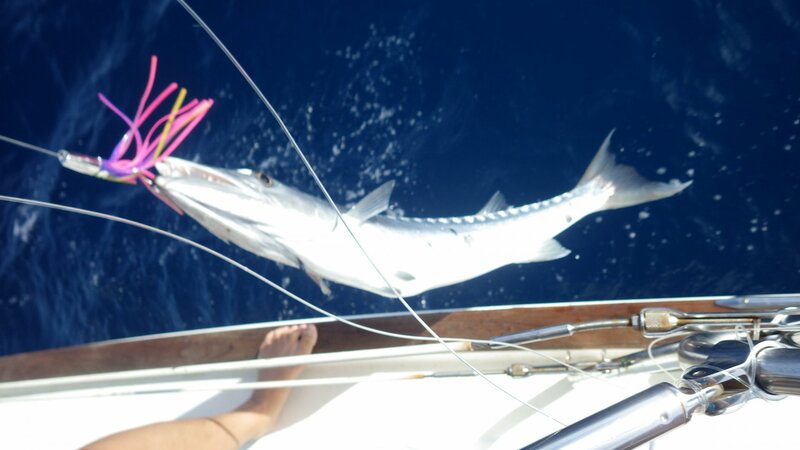 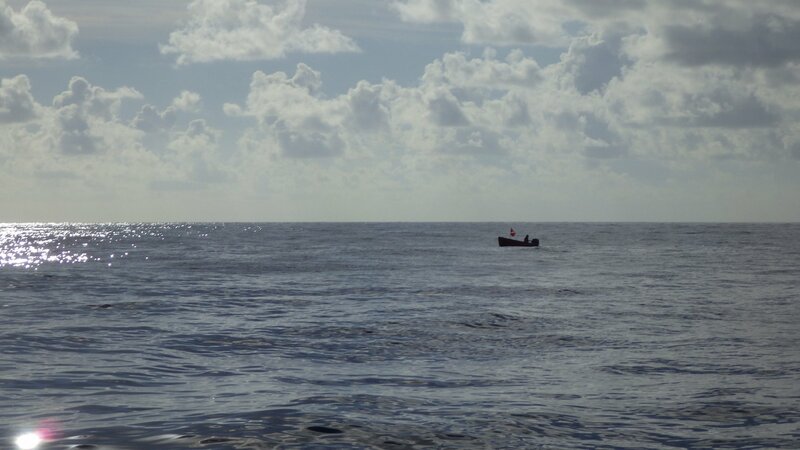 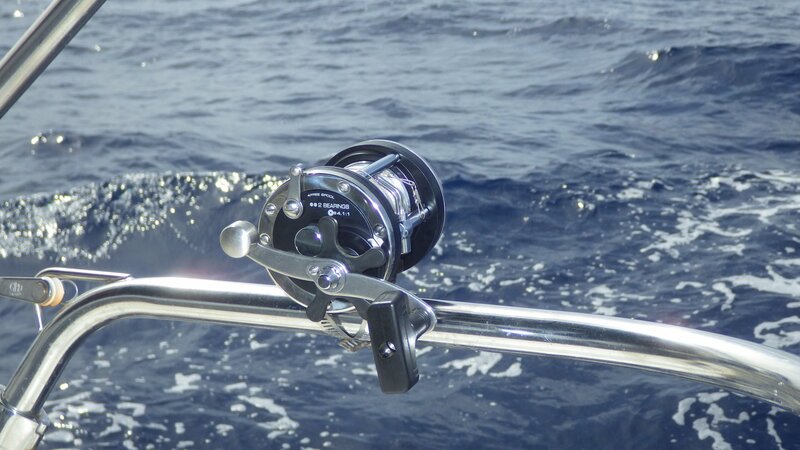 Our fishing on the way wasn't too bad either � twice we caught barracuda, but decided to release them. 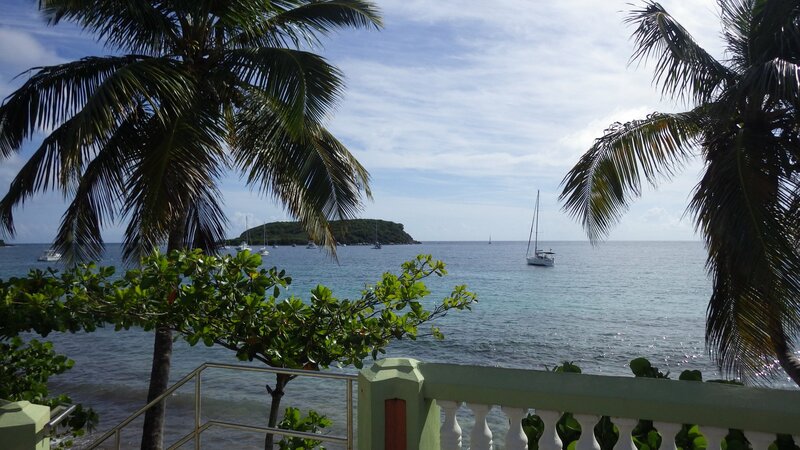 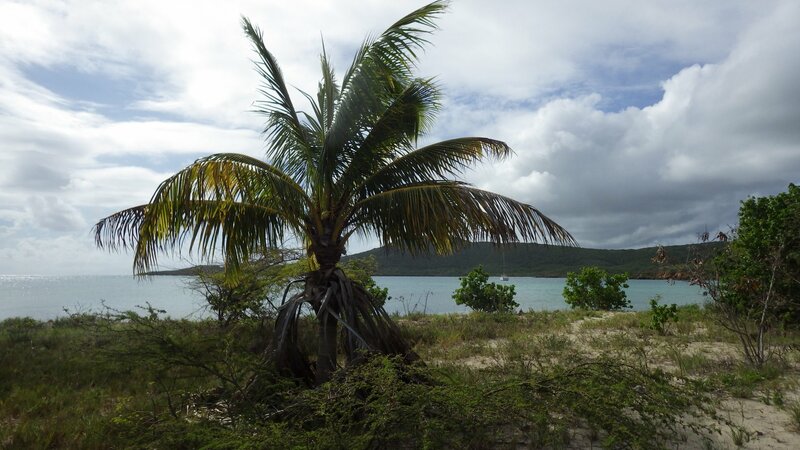 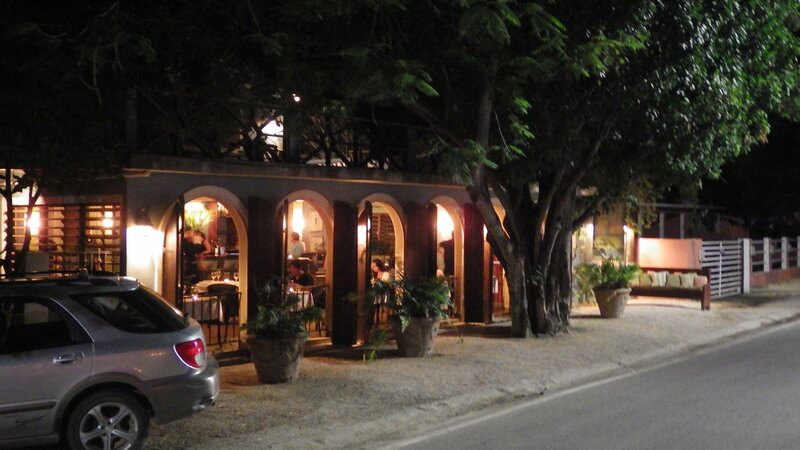 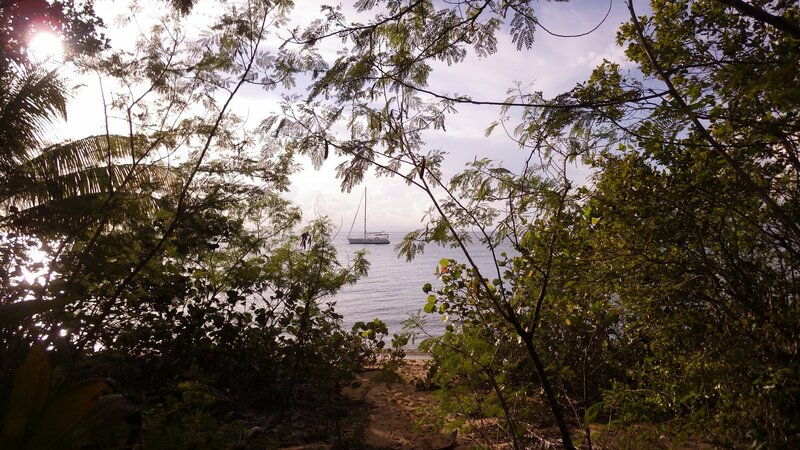 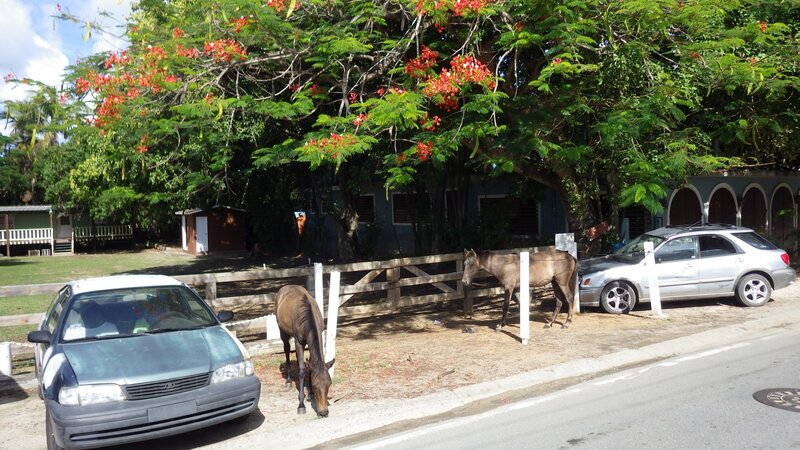 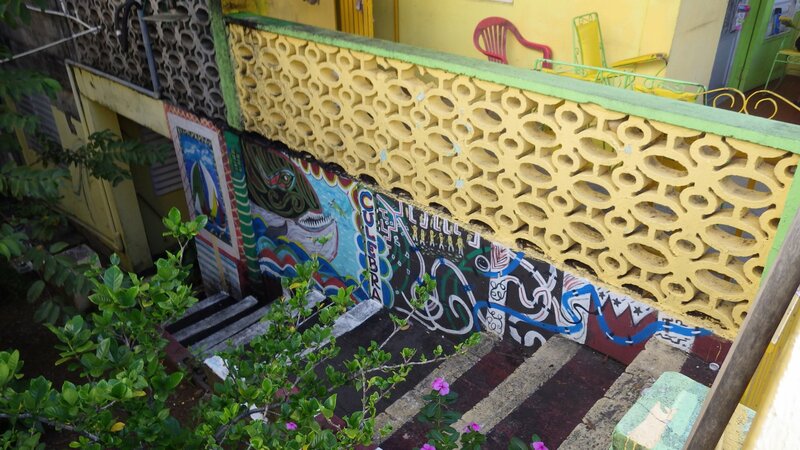 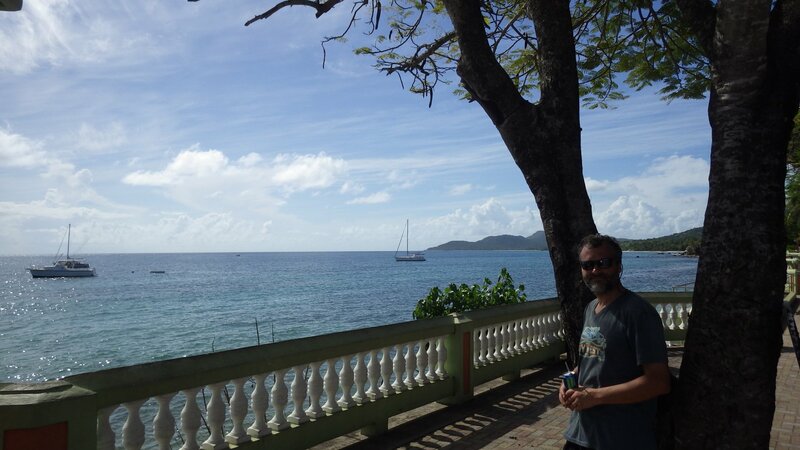 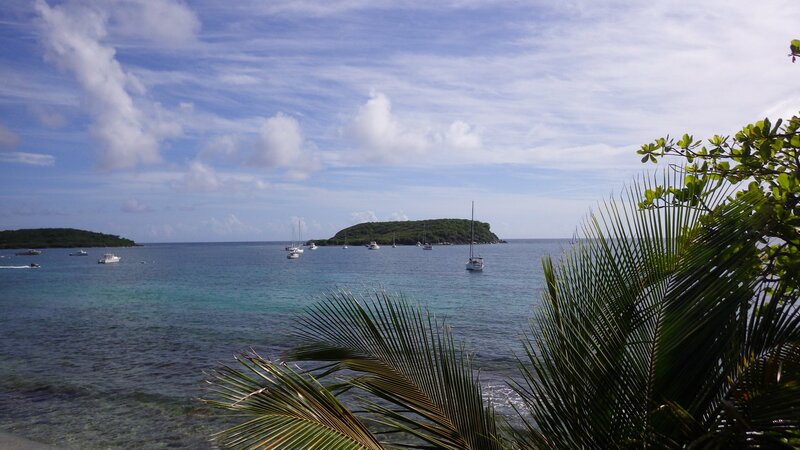 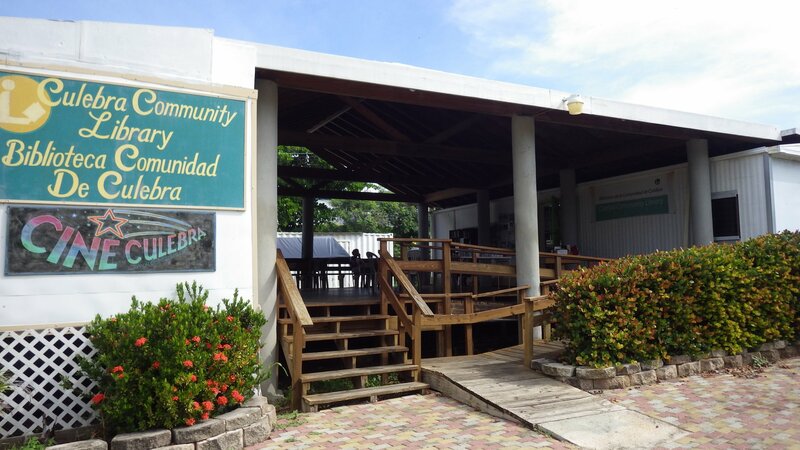 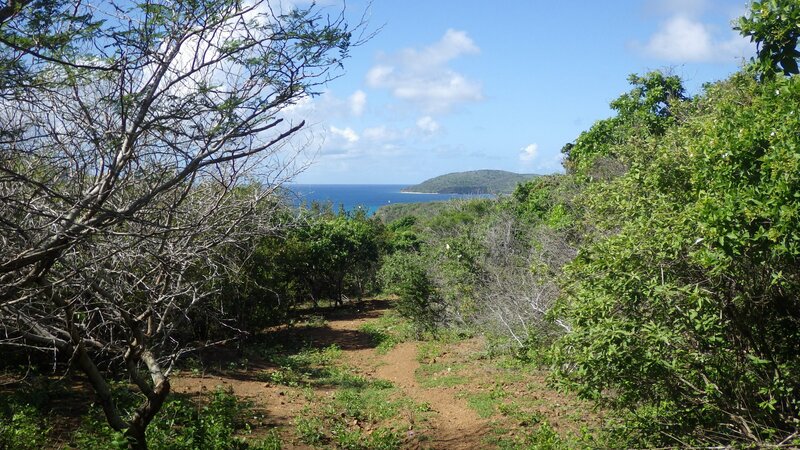 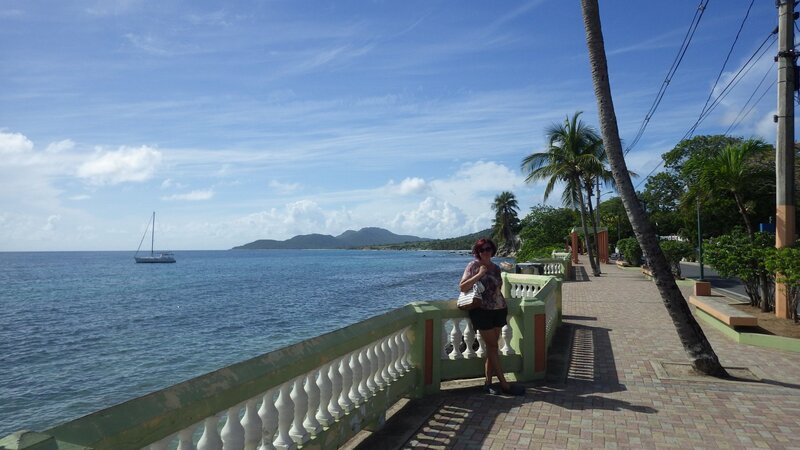 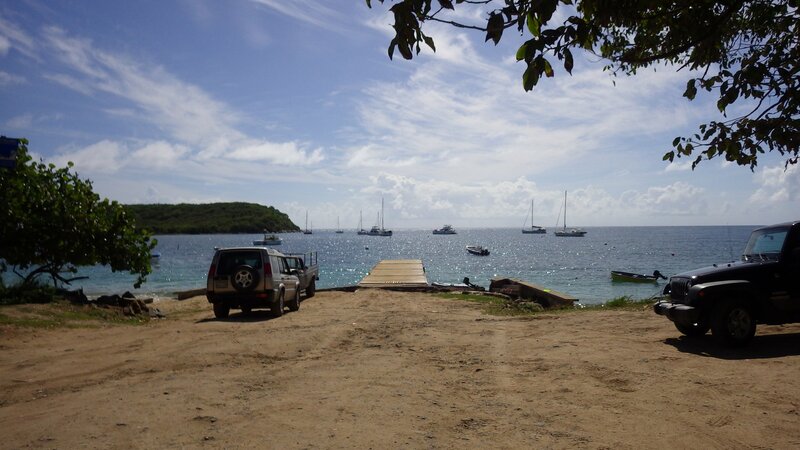 Our first stop at SVI was at the west end of Vieques Island. 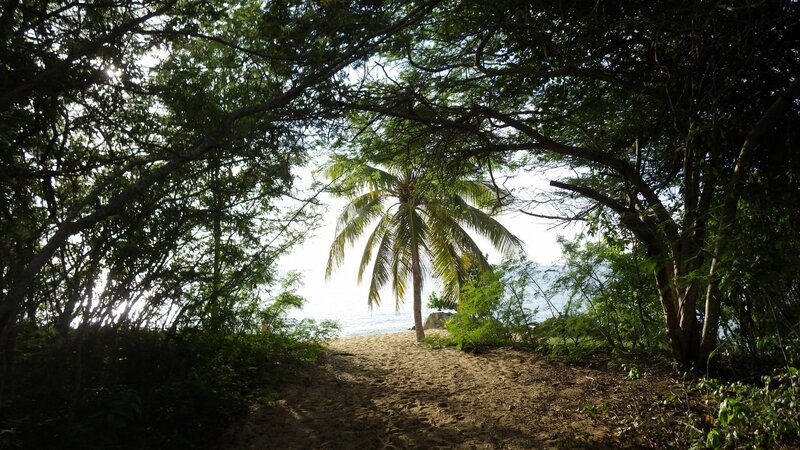 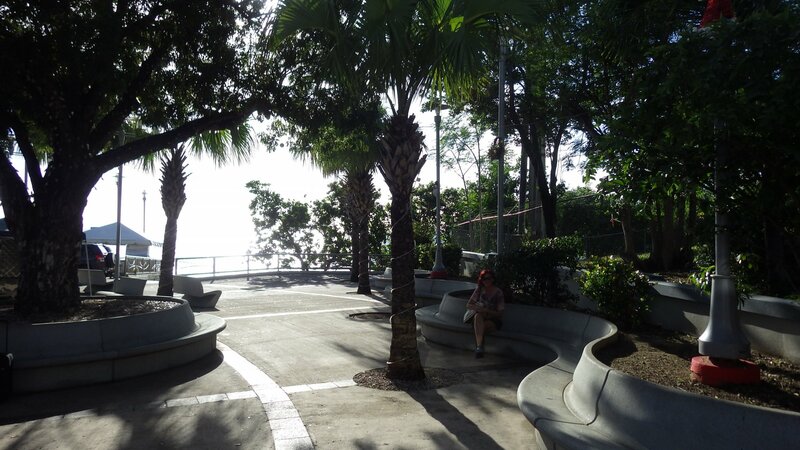 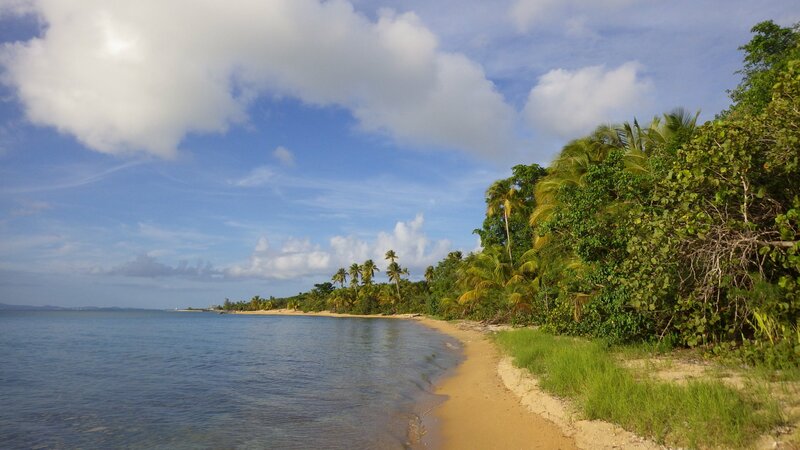 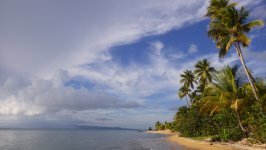 The Green Beach is a picturesque place, popular with weekenders - beautiful palm treed beach on one side, and gorgeous sunsets overlooking main Puerto Rico island on the other. 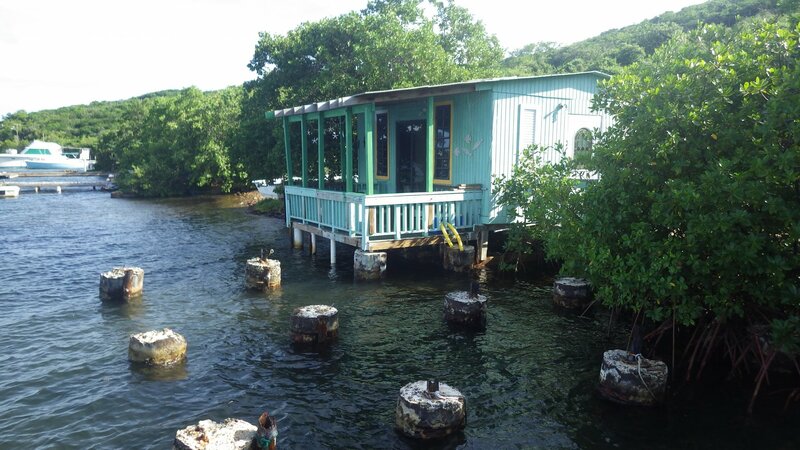 Stayed here for couple days. 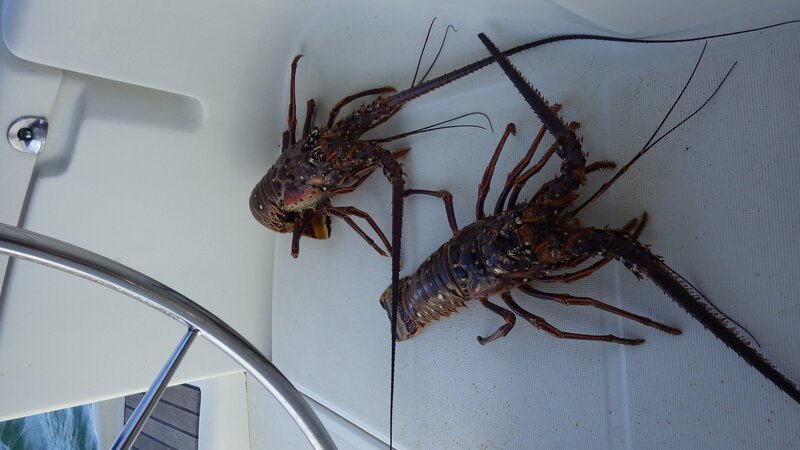 Unfortunately, bugs (no-see-ems) at the shore were quite persistent � we interrupted our planned beach picnic and paddled quickly back to the yacht. 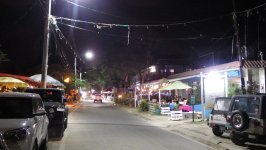 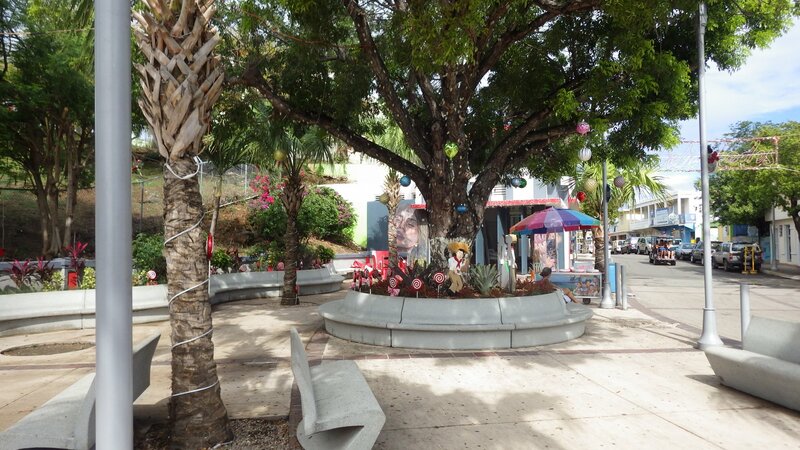 Esperanza is a small "fun town" � restaurants/bars, tourist's gift shops and services like tours and rentals, and VERY LOUD music at night until 1am (we were here during Thanksgiving holidays). 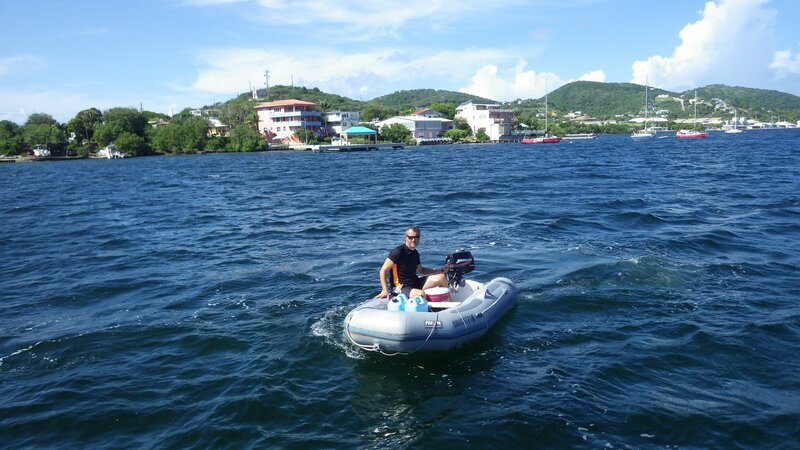 We have found that our outboard engine for the dinghy was not working well after several months of storage. 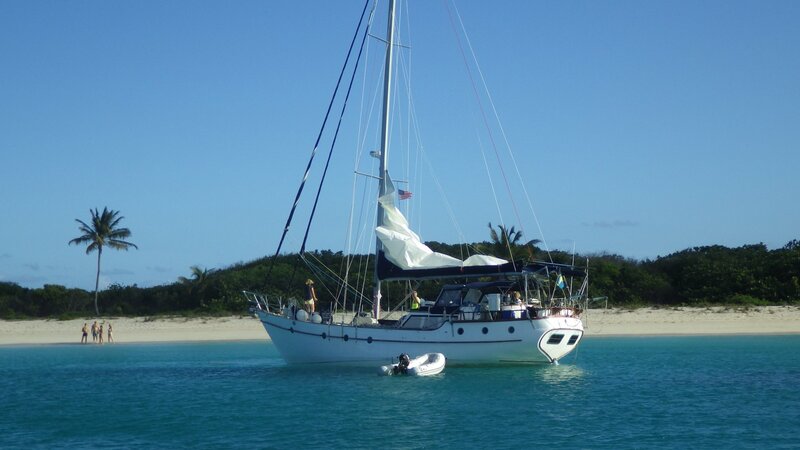 My tinkering with it helped a little, but it was unreliable and ultimately we had to find mechanic to look at it. 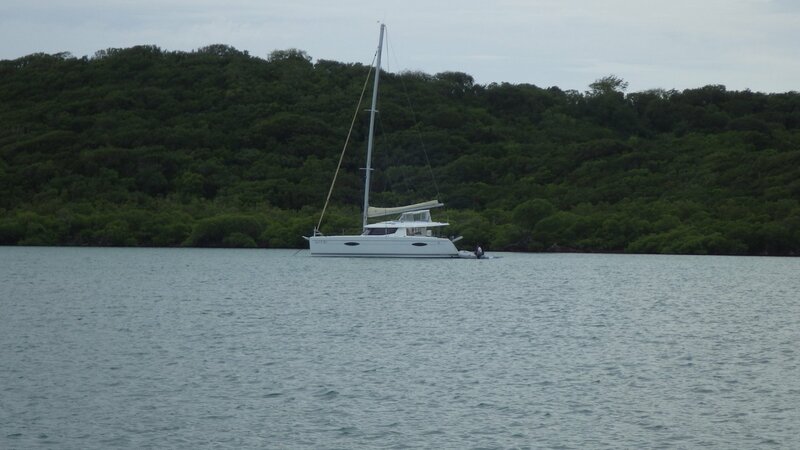 Fortunately, we were able to find one and our motor was serviced within a day, at a good price. 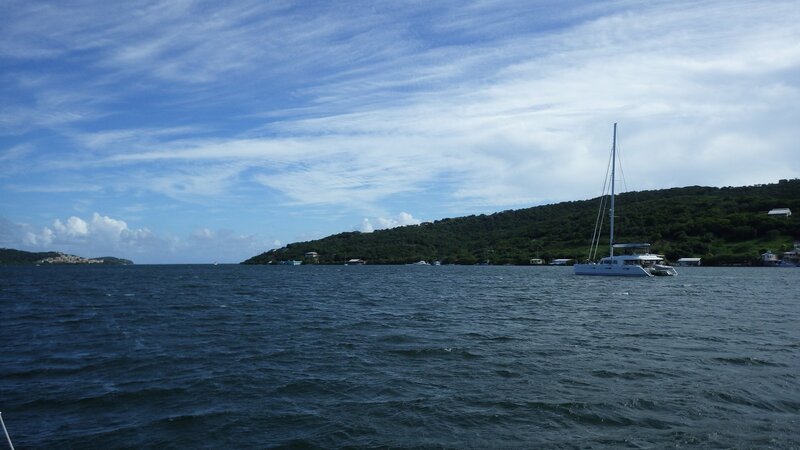 The anchorage here is open to swell from the South and it was quite uncomfortably rolly even in relatively calm water. 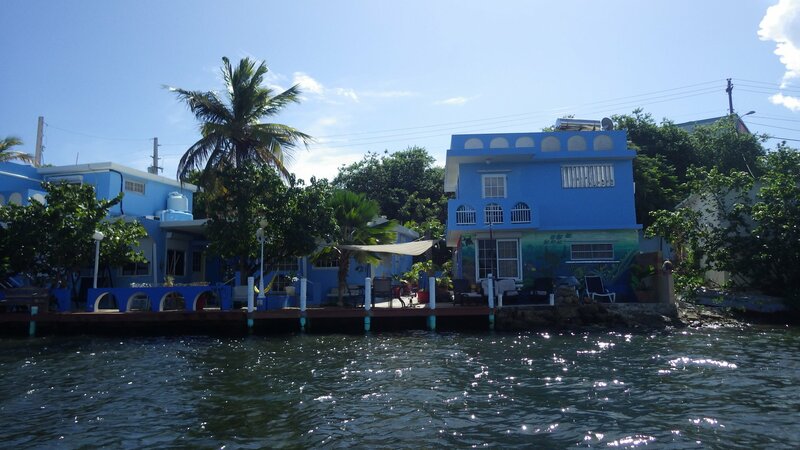 After spending two nights here we decided to move on. 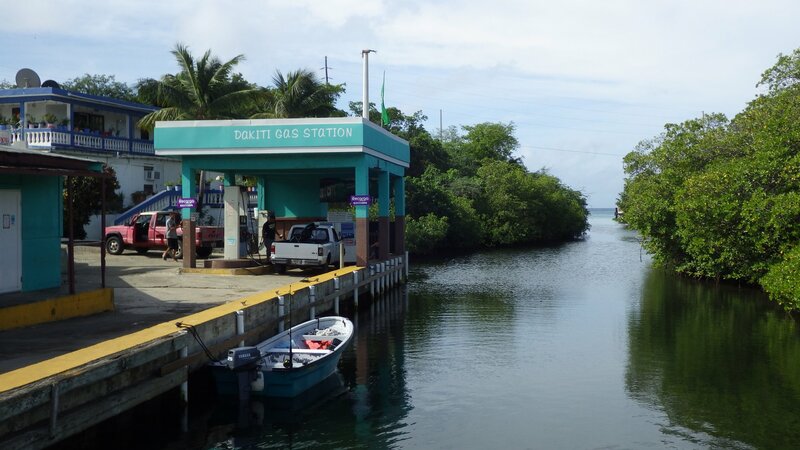 We didn't have a chance to take the Bio Bay Tour (night trip to the biofluorescent bay) � it will be on our to-do list next time we're in the area. 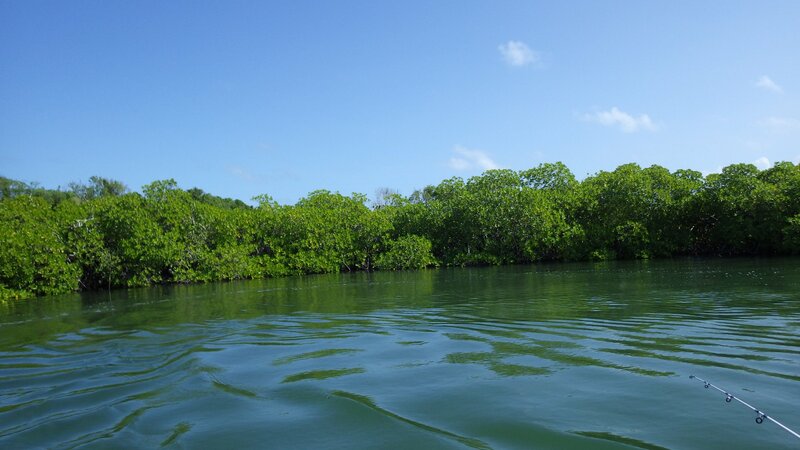 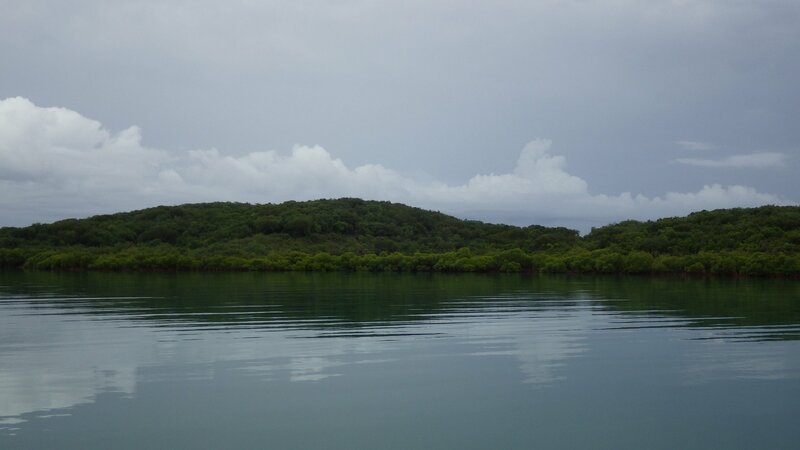 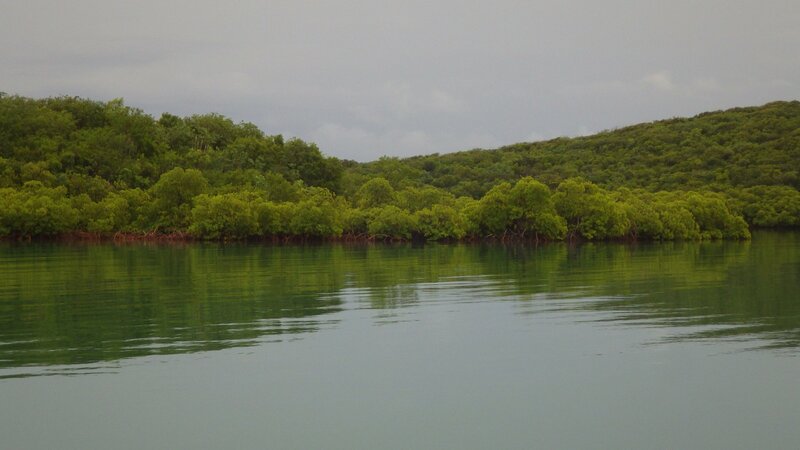 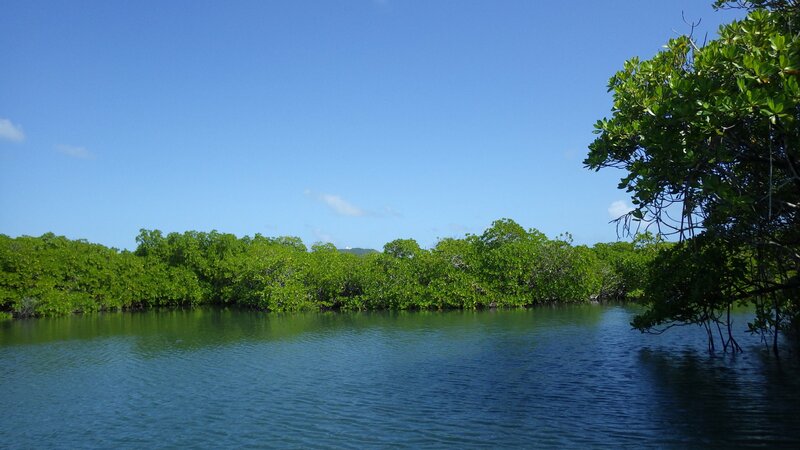 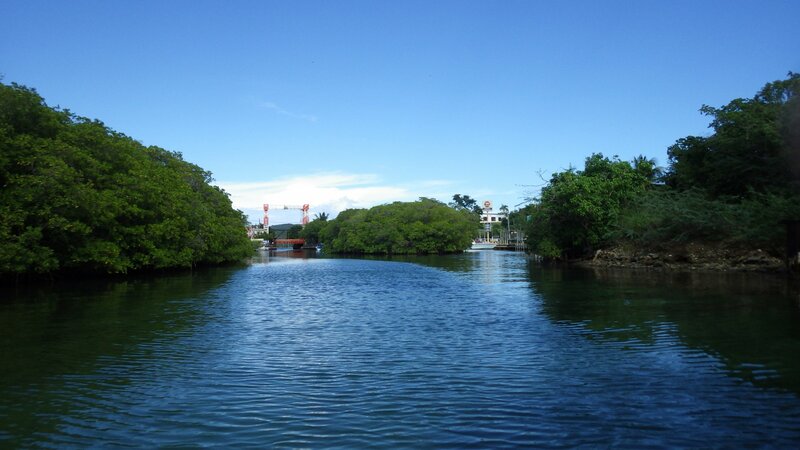 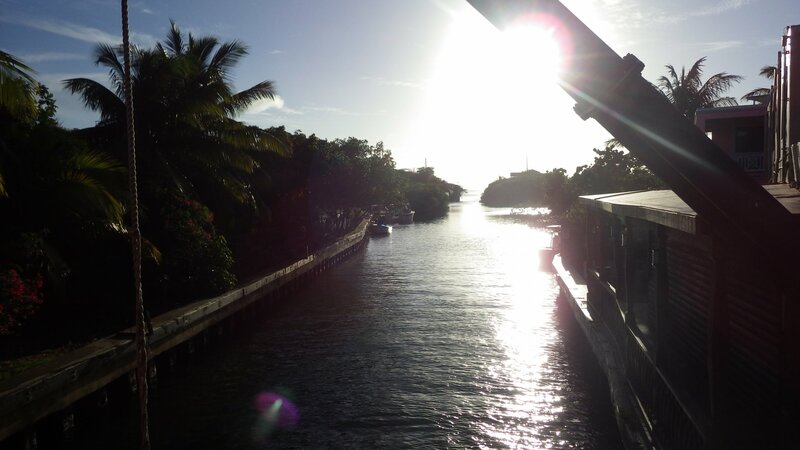 Ensenada Honda is a wonderfully tranquil and secluded mangrove anchorage. 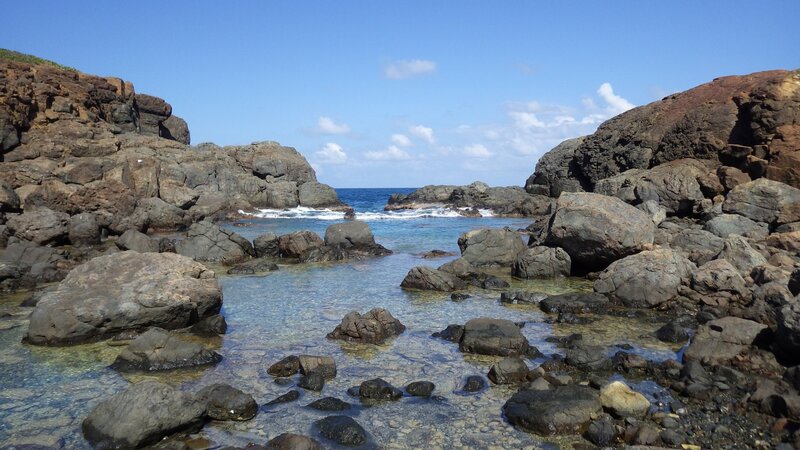 We spent two days here. 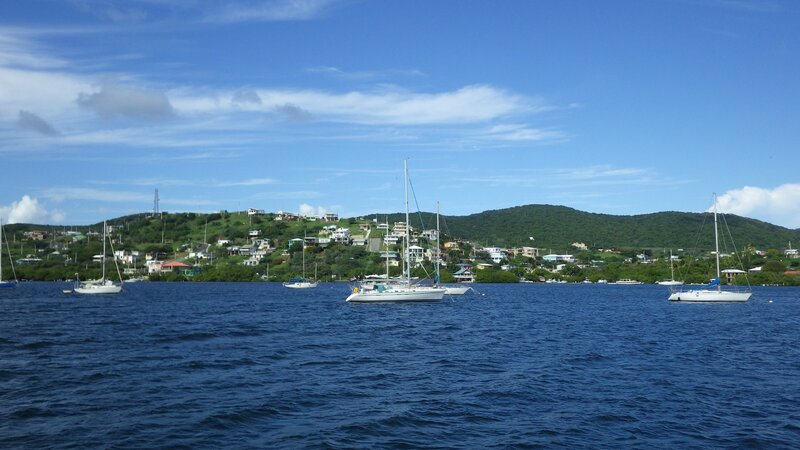 First day, I did some boat projects and later we met with a nice cruising couple for cocktails who was also anchored here in the bay on their catamaran. 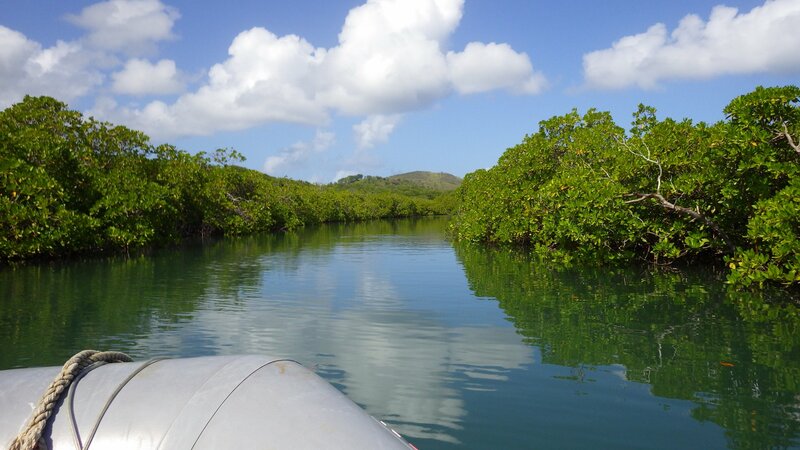 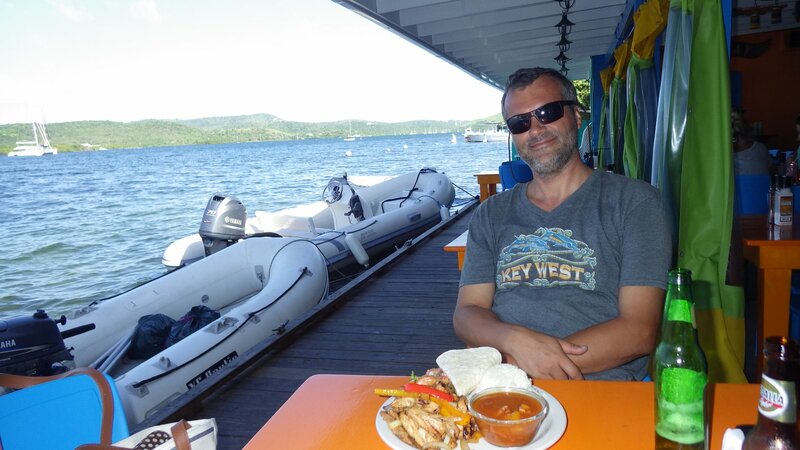 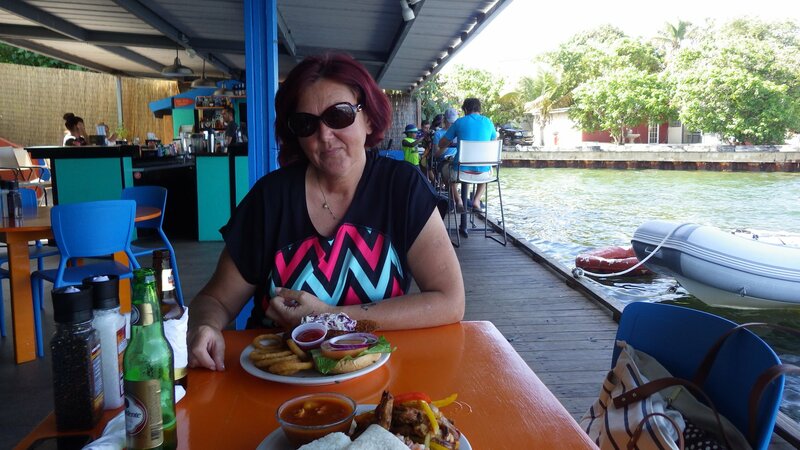 Second day we had the entire bay to ourselves � explored mangrove coves by dinghy, fished, I got haircut, and just relaxed. 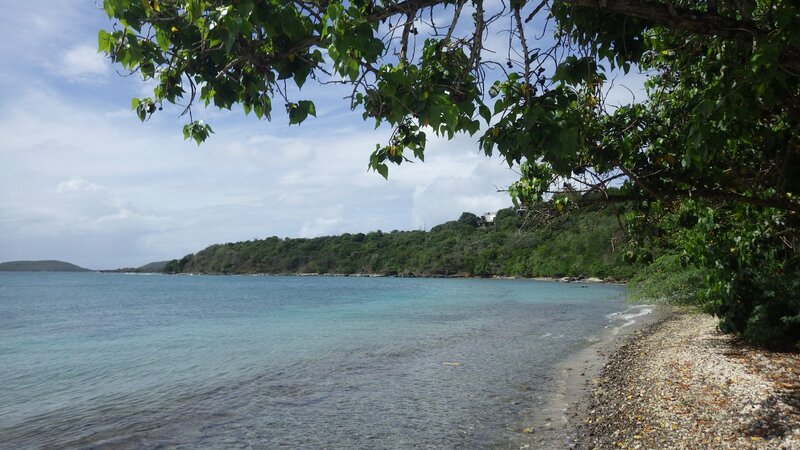 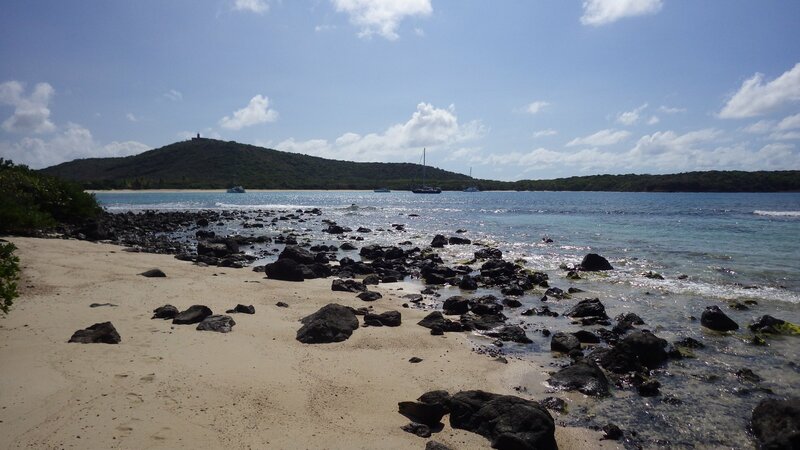 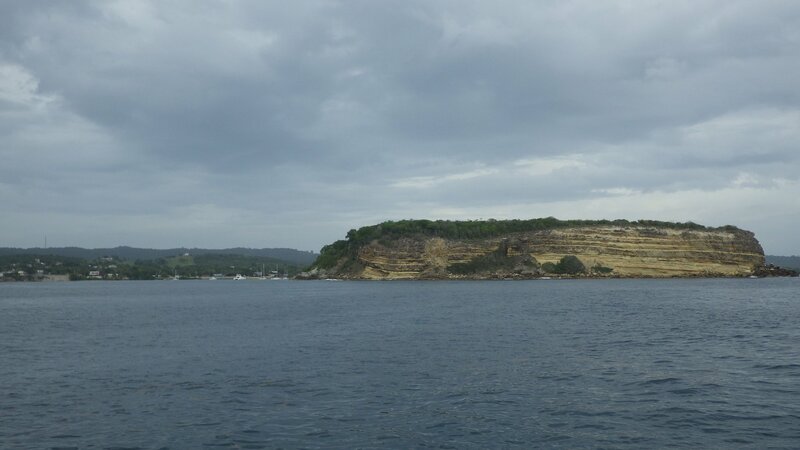 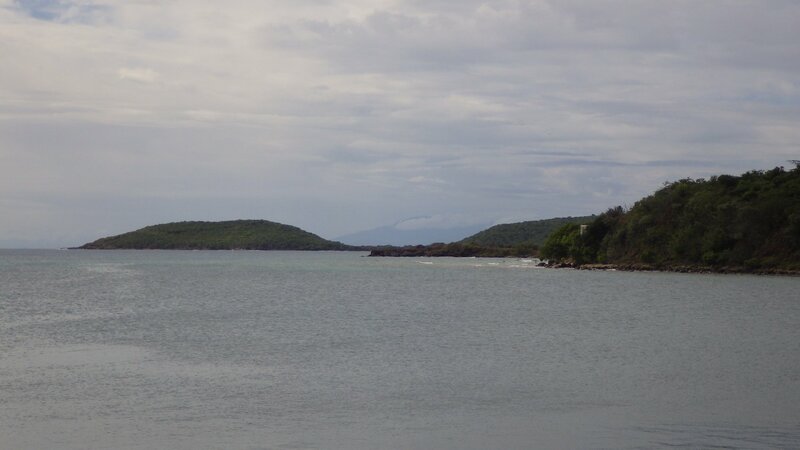 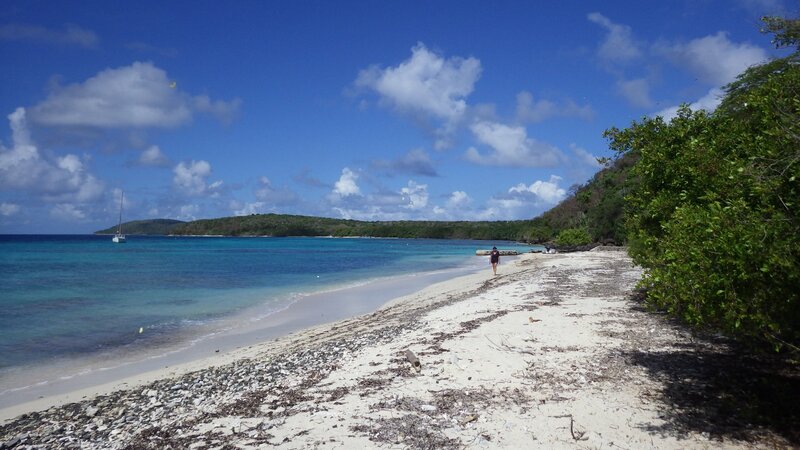 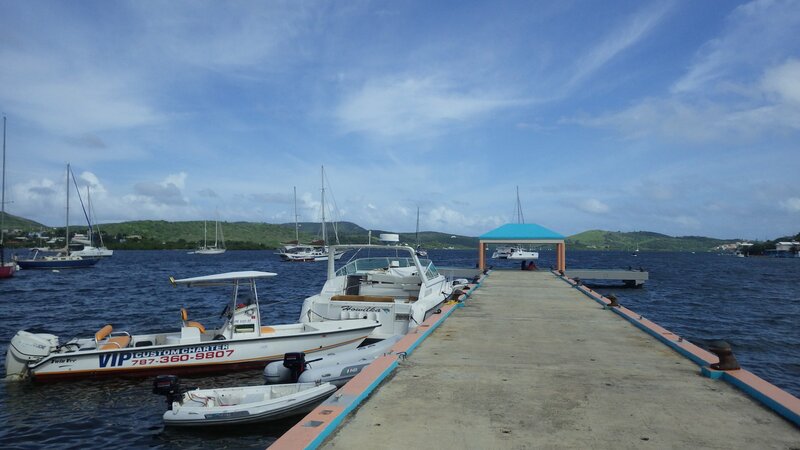 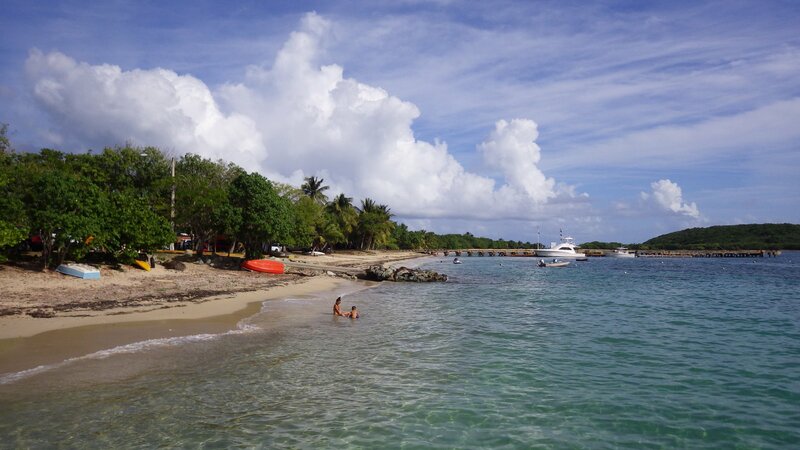 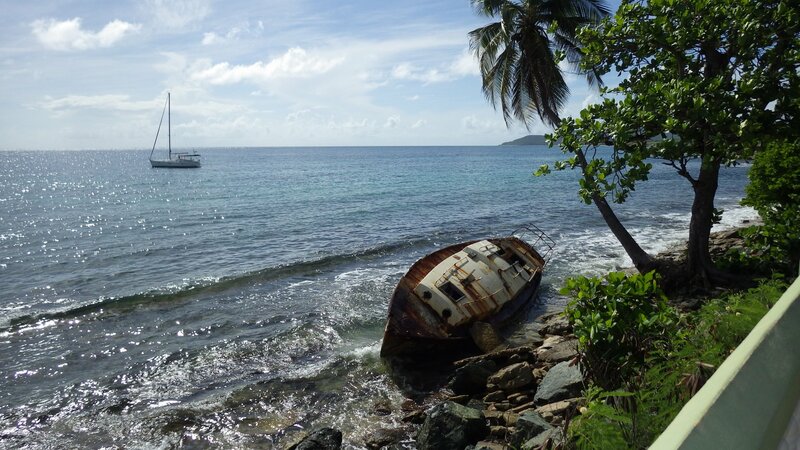 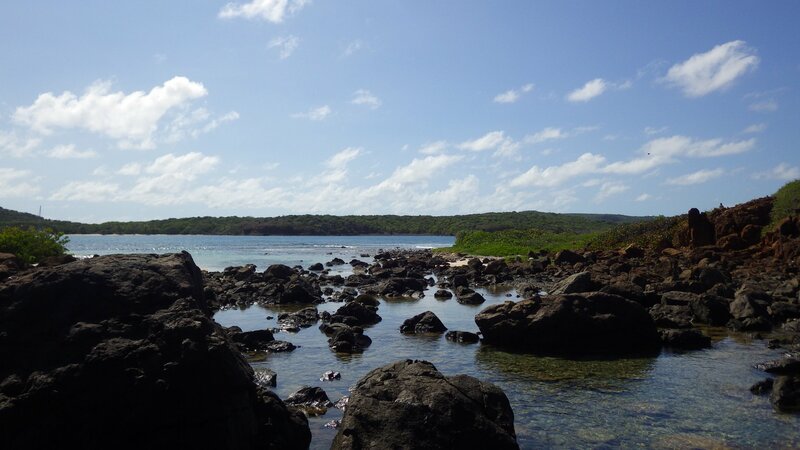 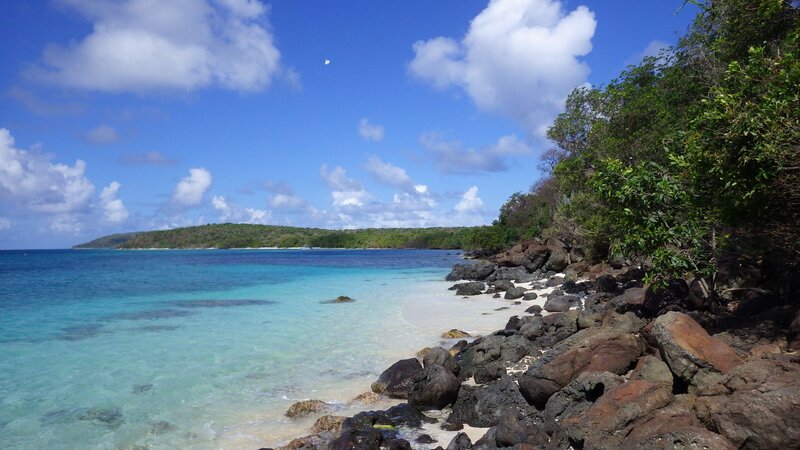 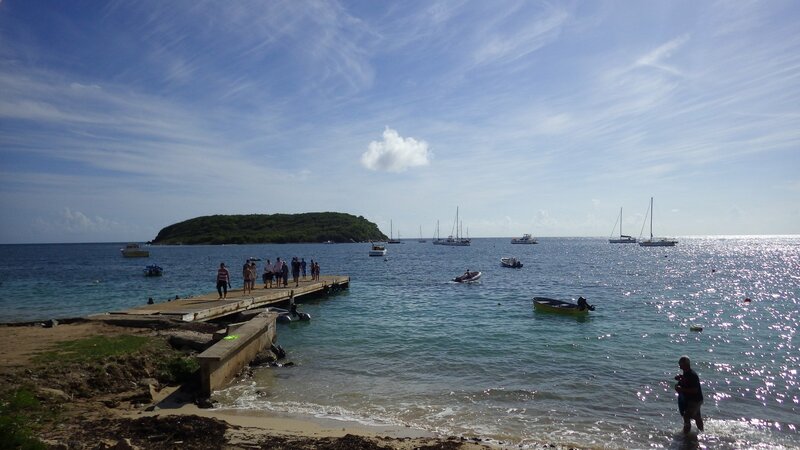 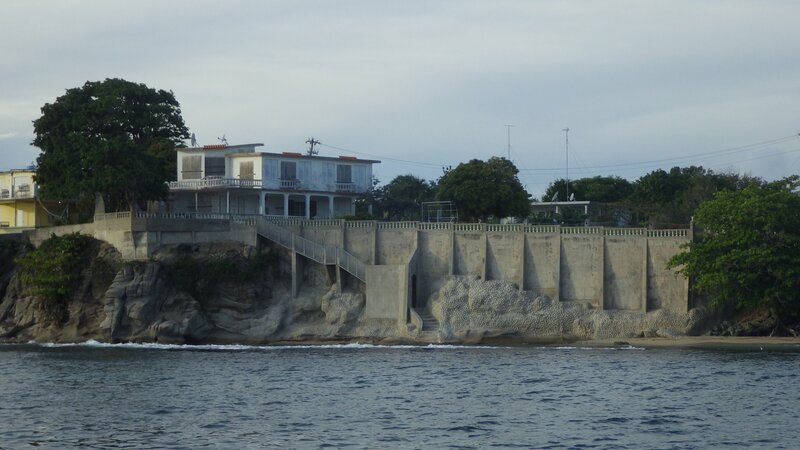 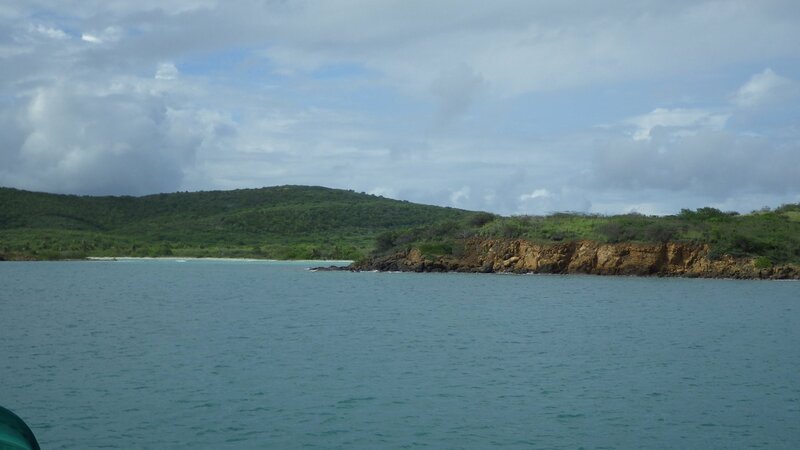 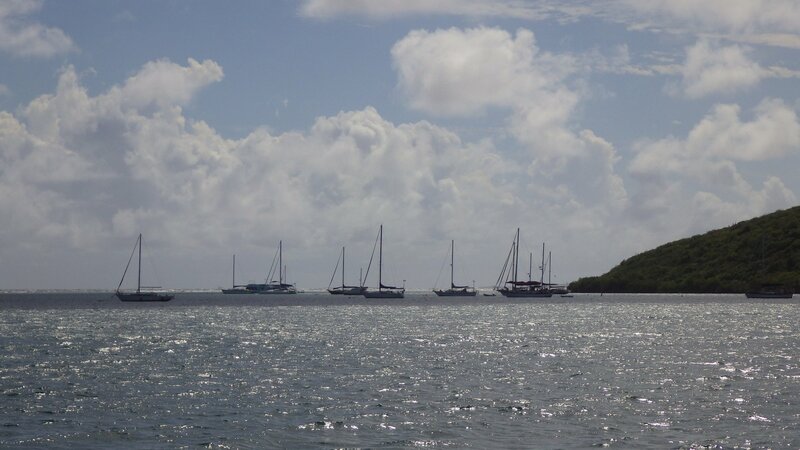 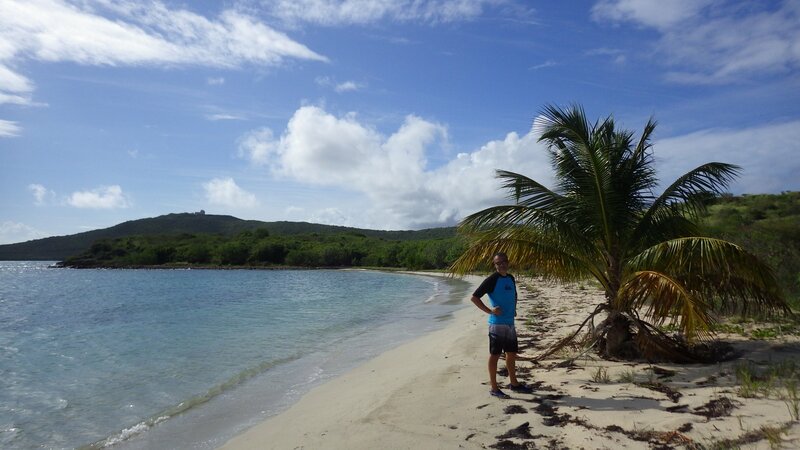 This is a one-day stop at the small bay on the South East end of the Vieques Island, staging our passage to Culebra. 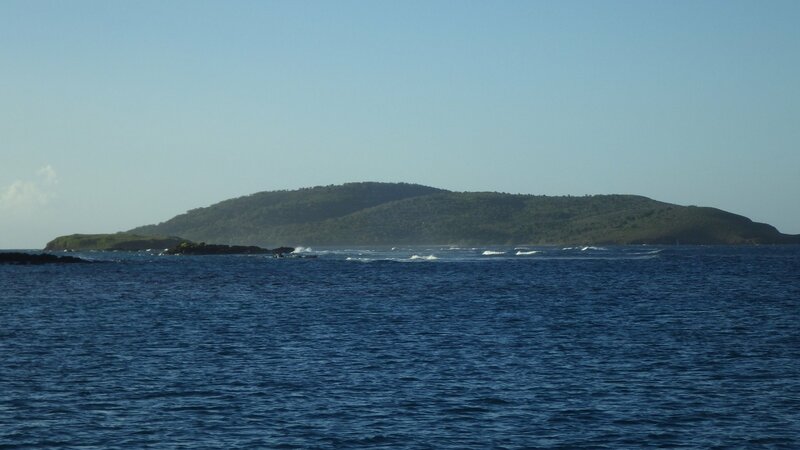 The bay is pretty and fairly protected from waves. 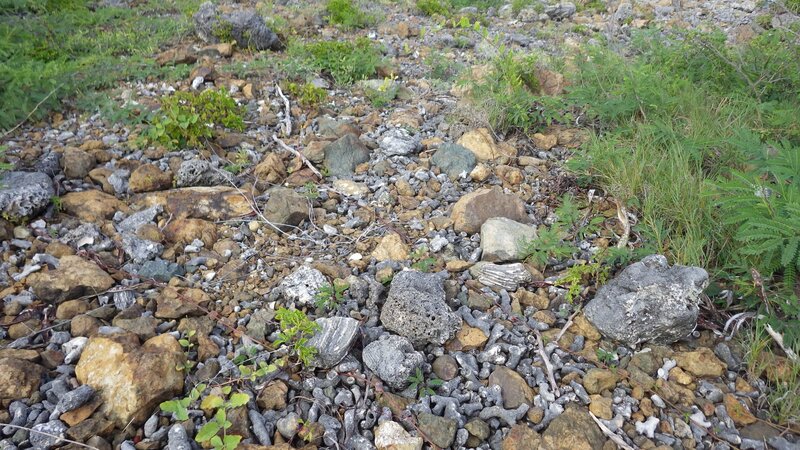 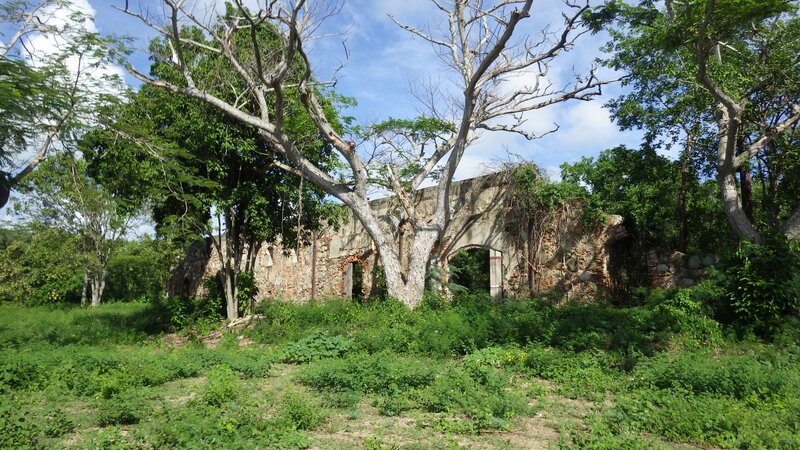 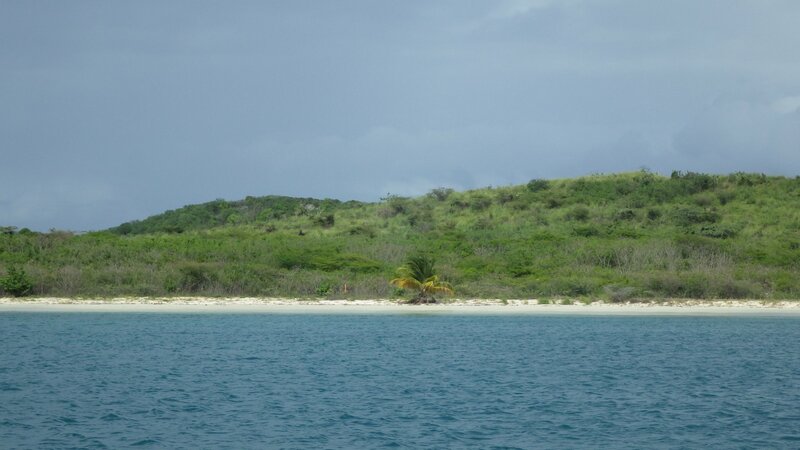 This part of the island was used by US military in the past as a firing range. 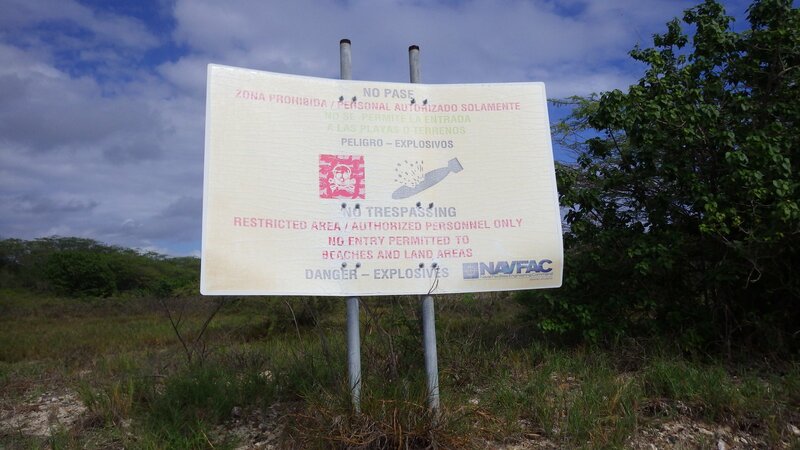 No wondering around is allowed due to unexploded ordnances. 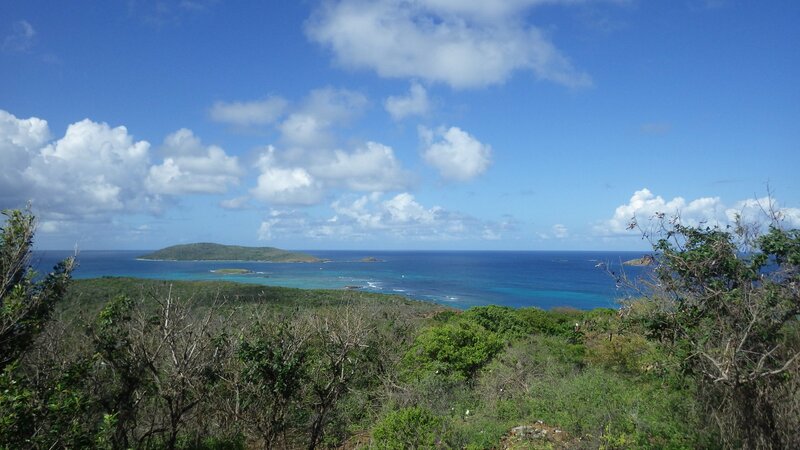 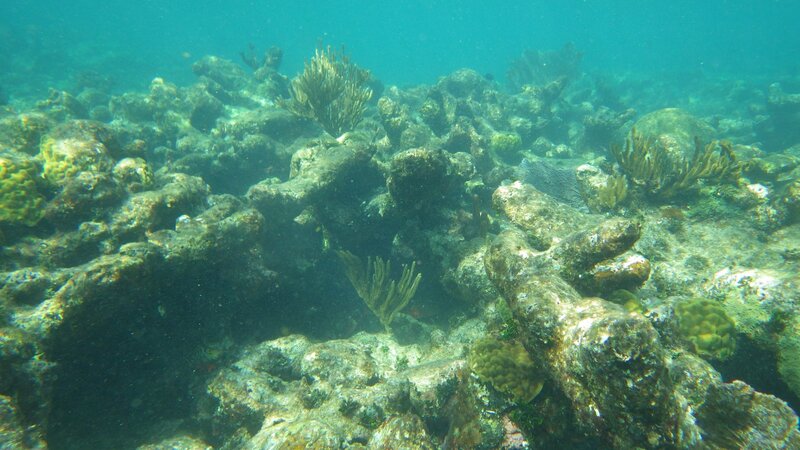 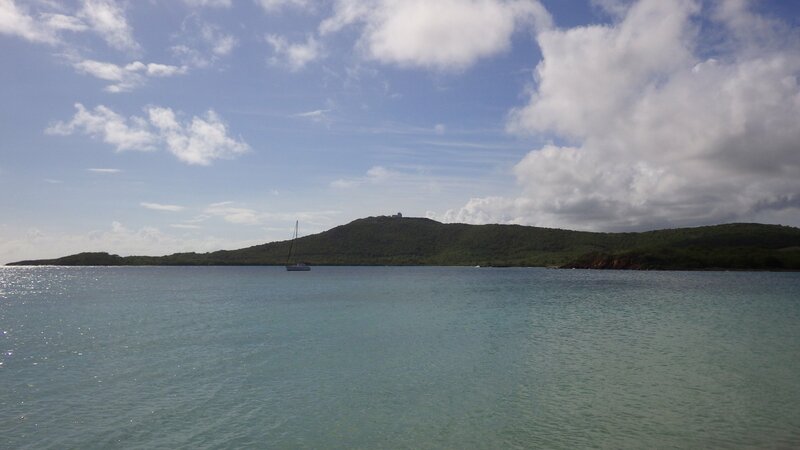 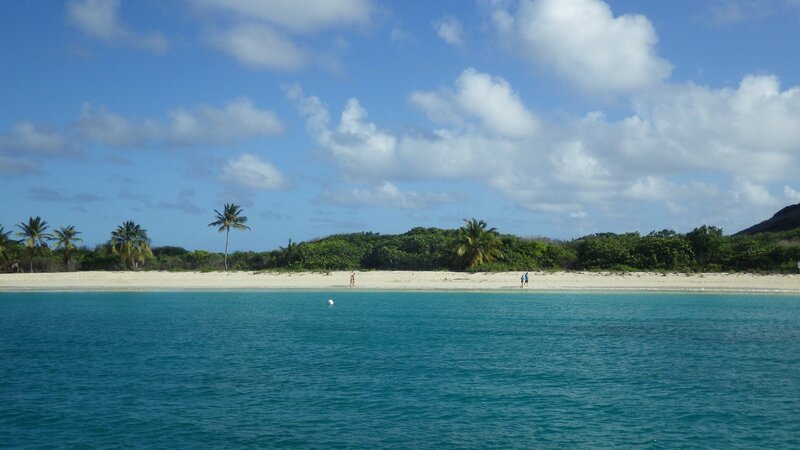 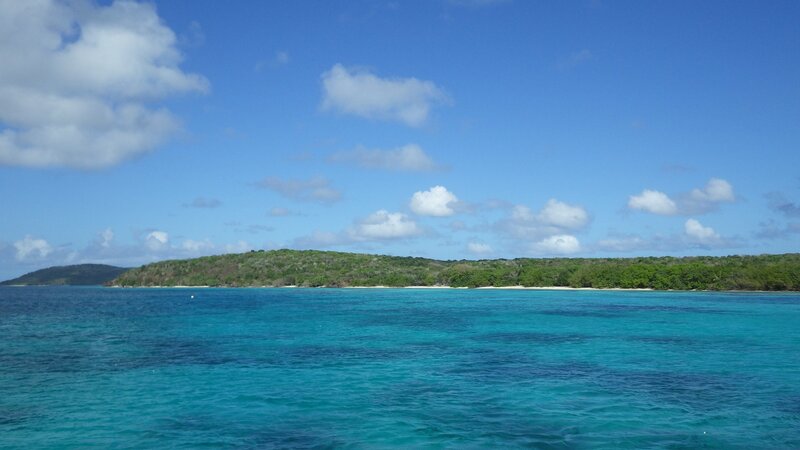 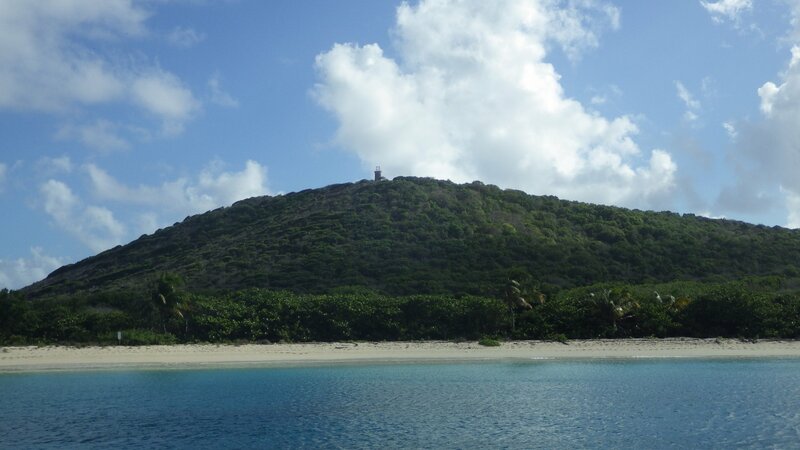 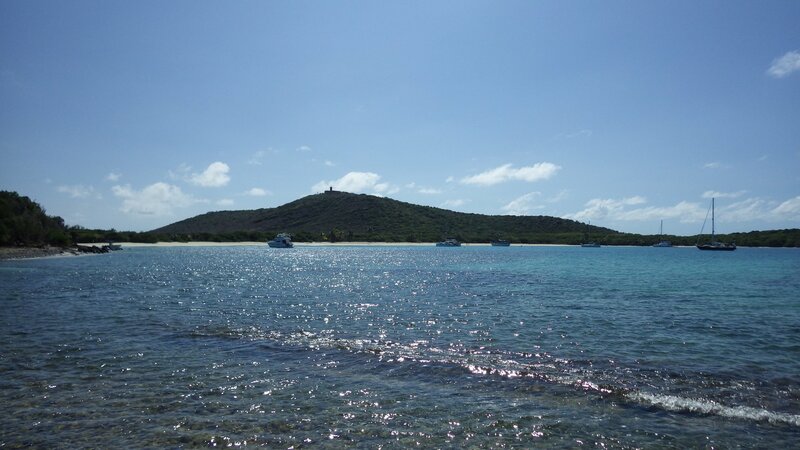 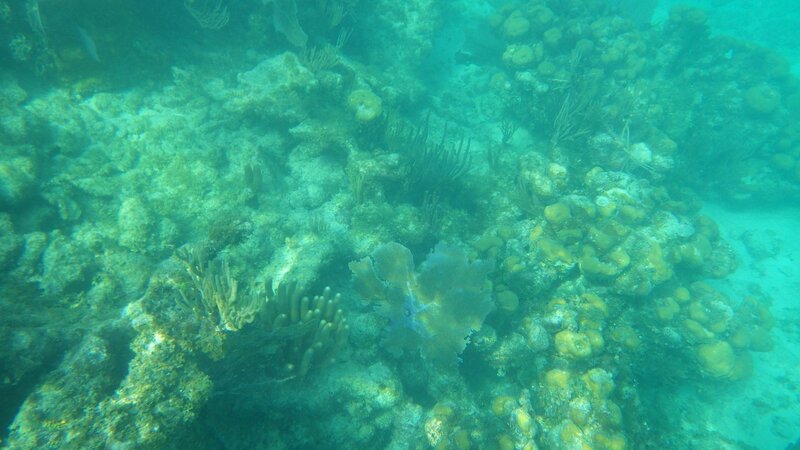 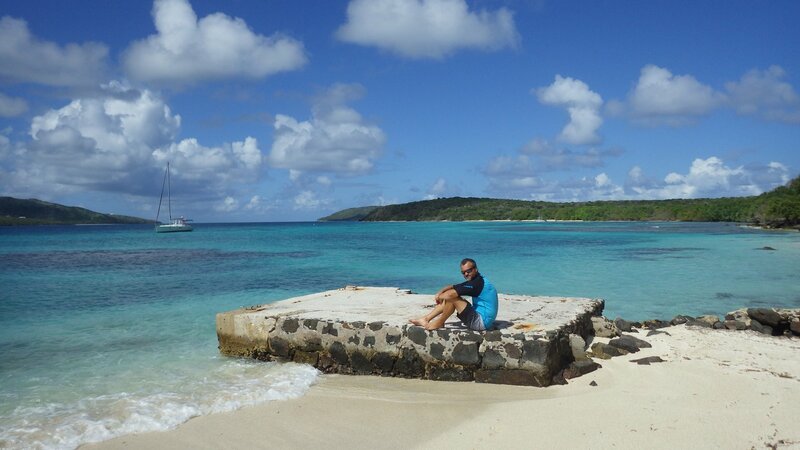 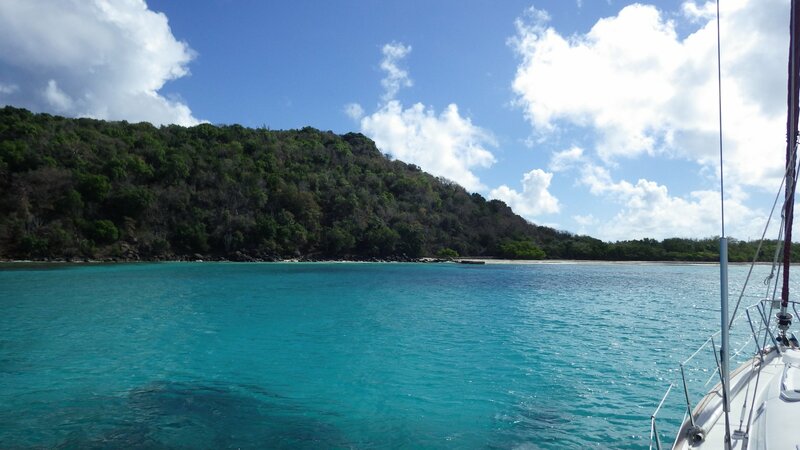 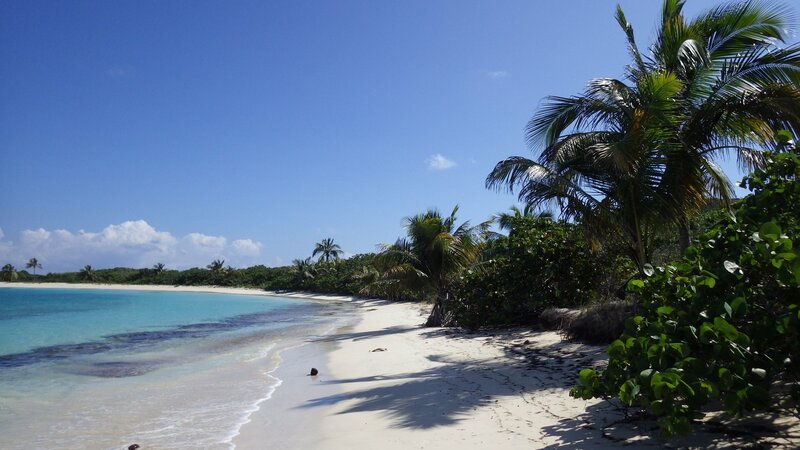 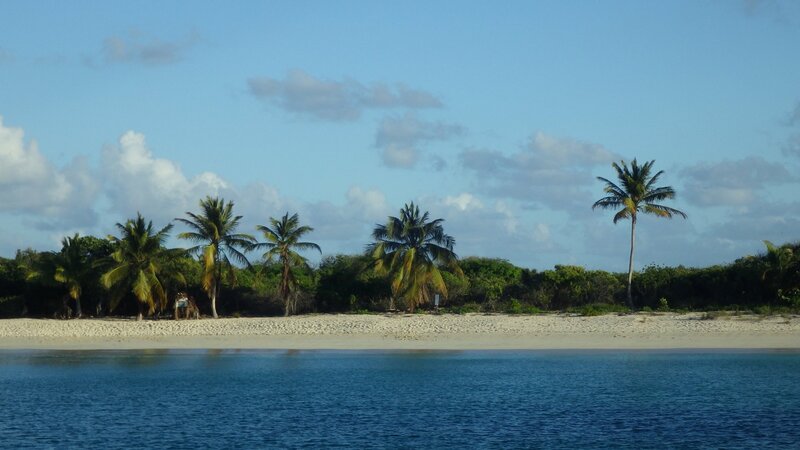 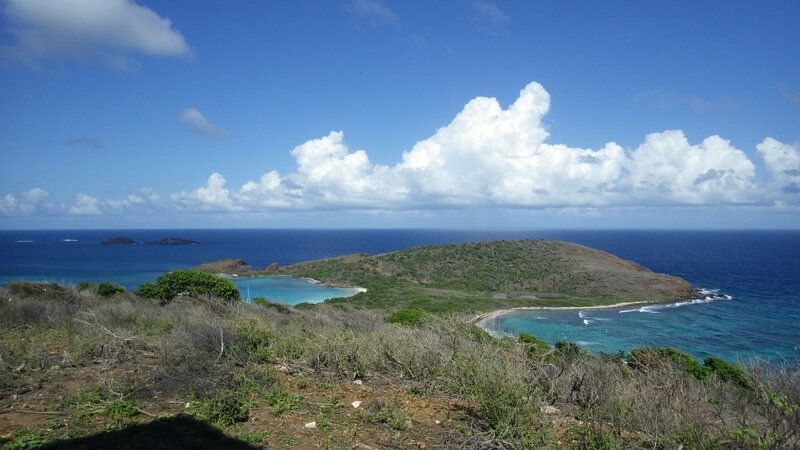 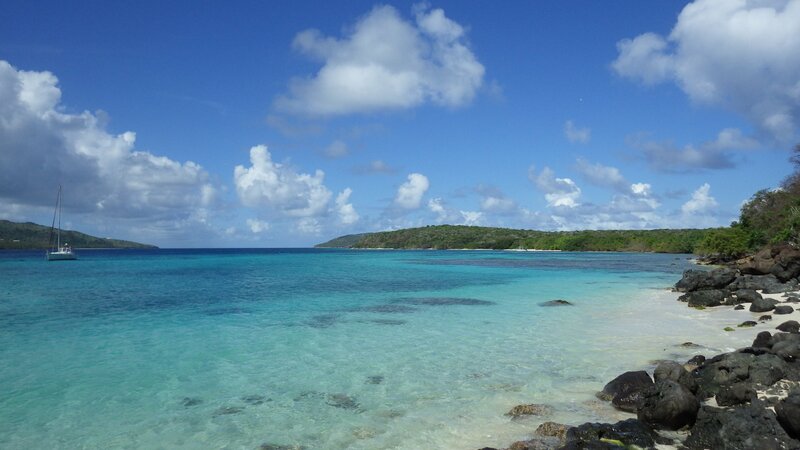 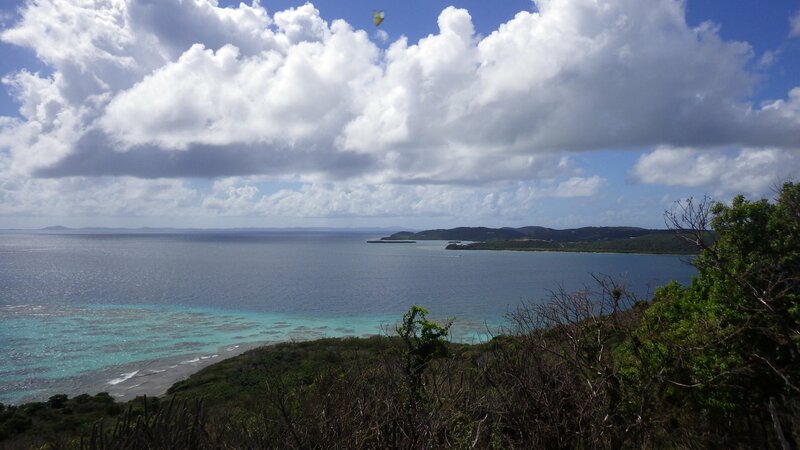 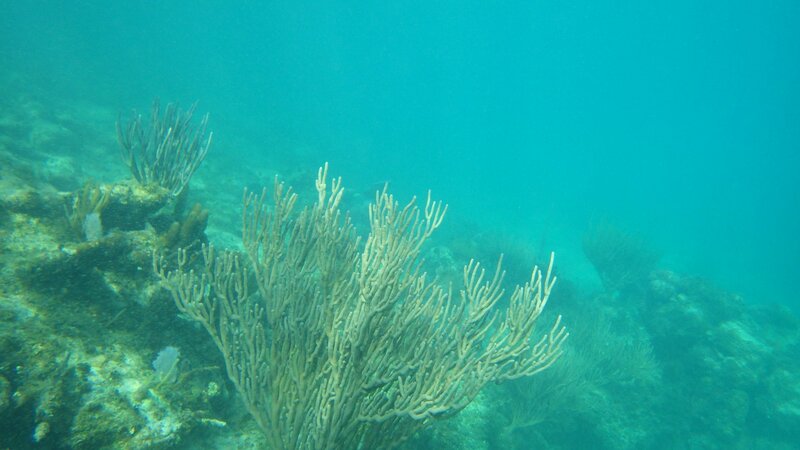 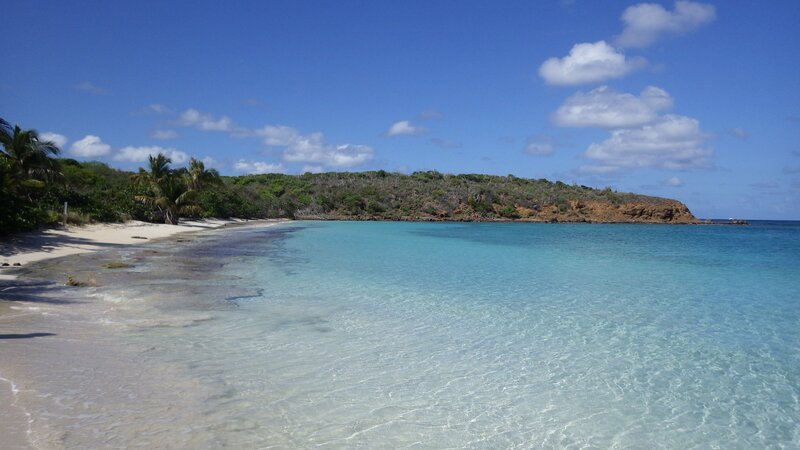 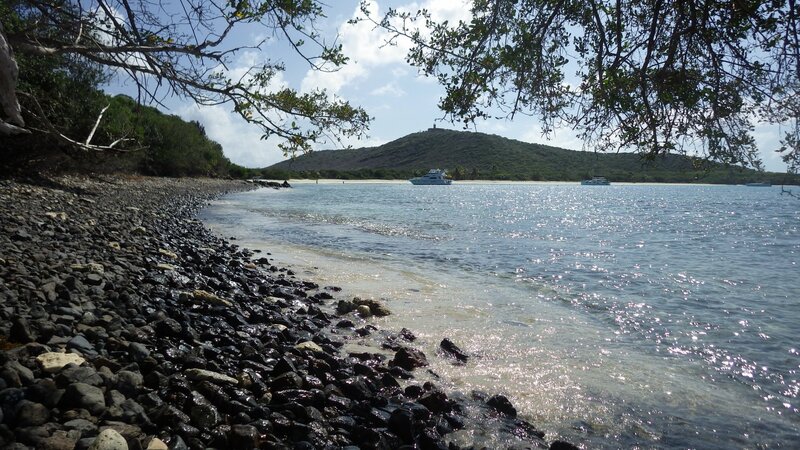 Culebra is a picturesque tropical island, with beaches and snorkeling reefs around it. 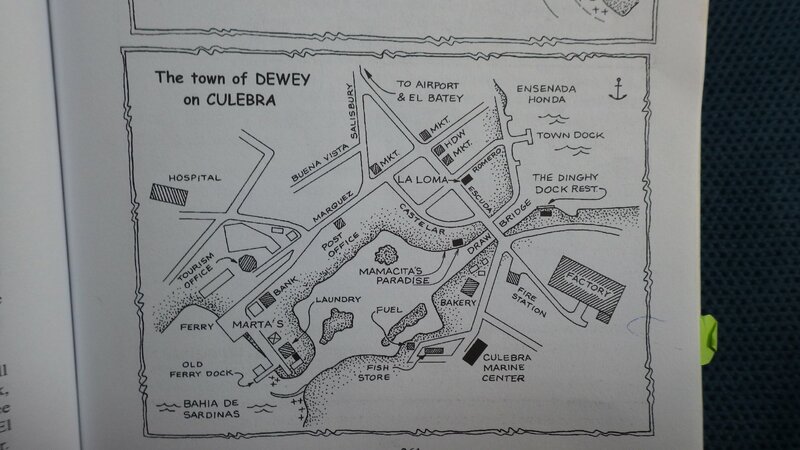 Dewey is its main town along the shores of a large protected inner basin. 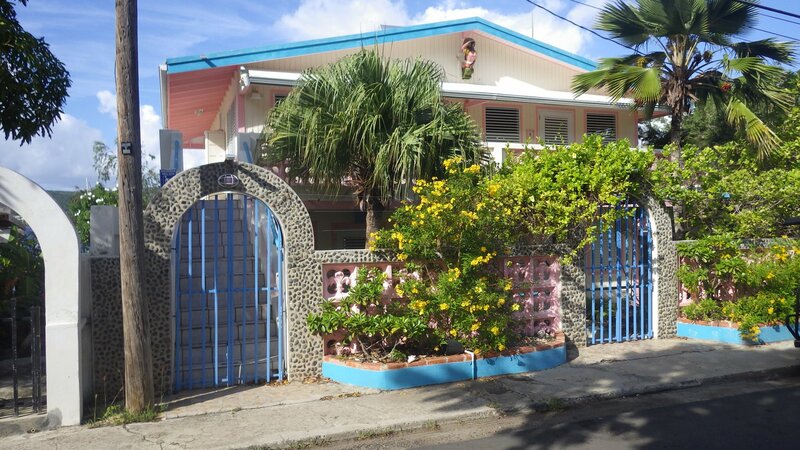 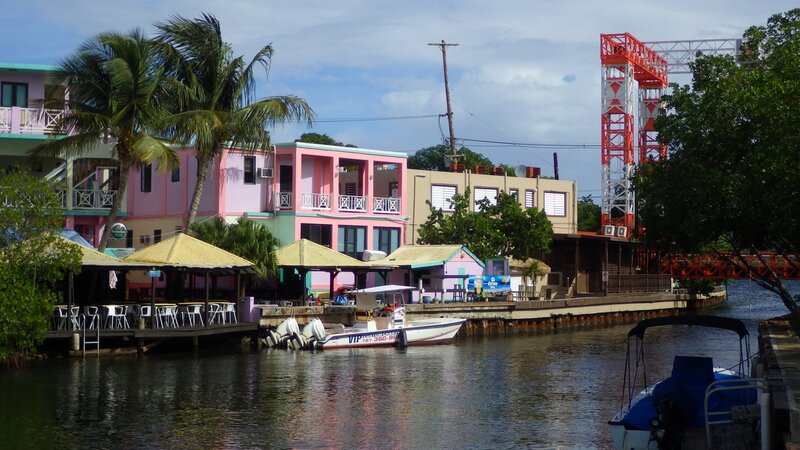 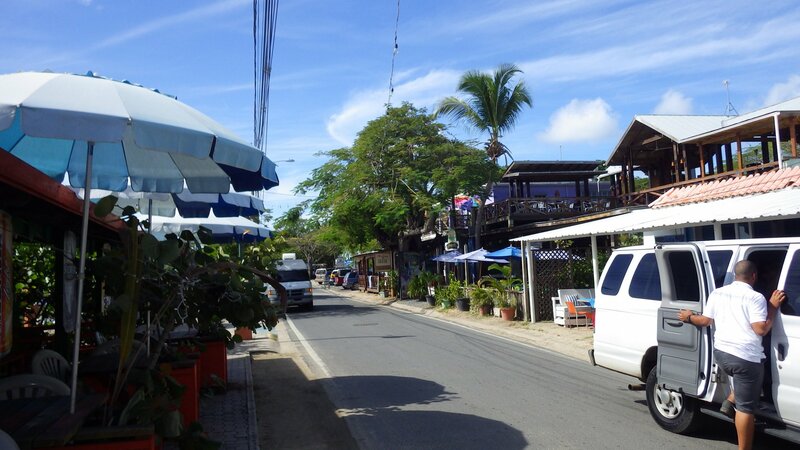 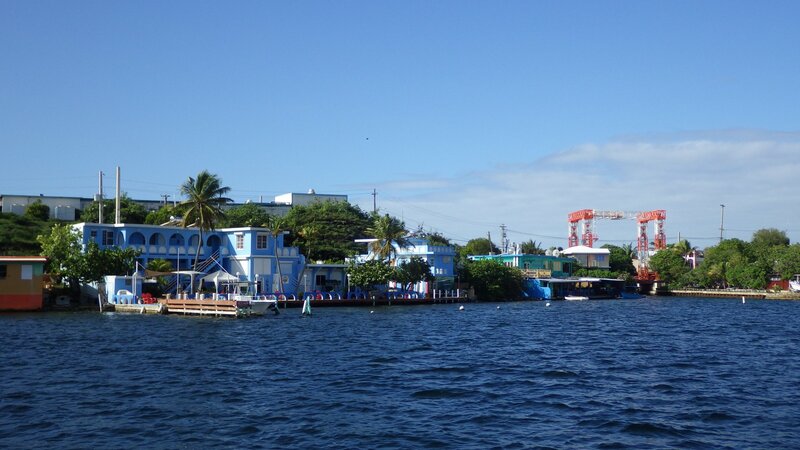 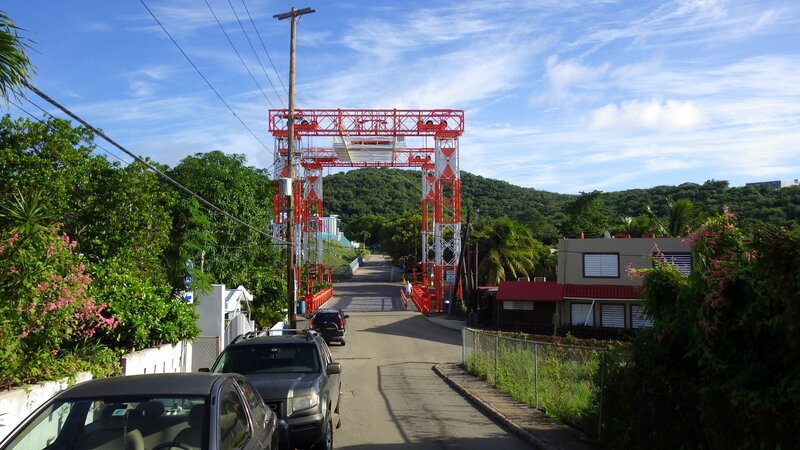 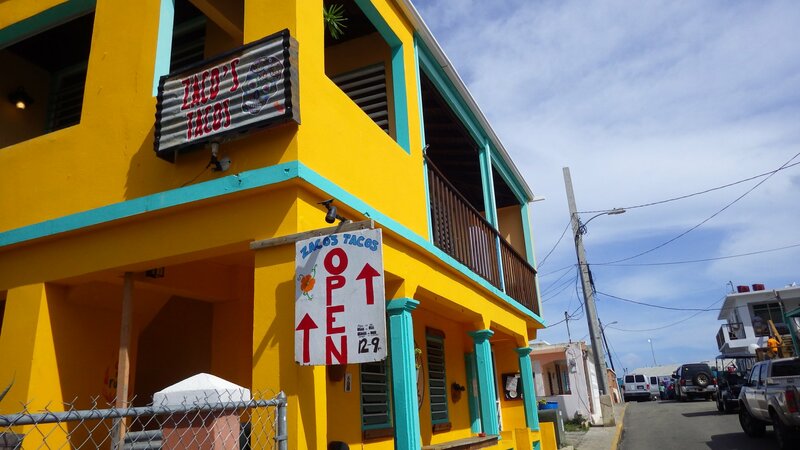 The town has a laid back atmosphere, with all the necessities - grocery stores, fresh food market, taco, pizza, cafes, interesting restaurants, bank, hospital, hardware and boutique stores, airport, ferry to the PR main island, etc. 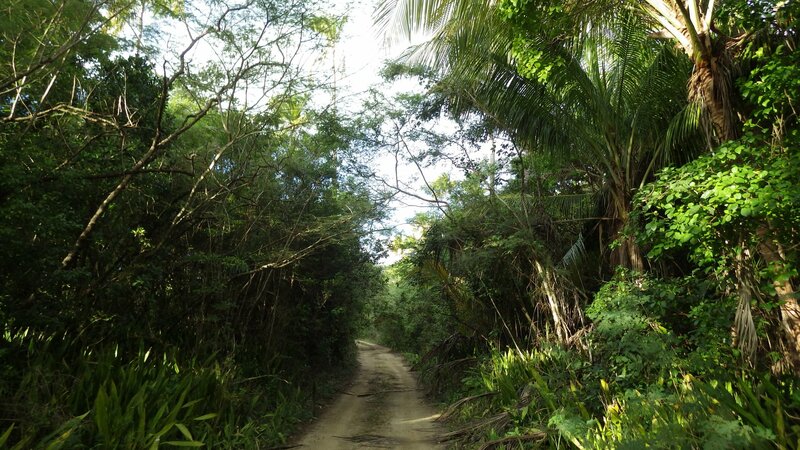 We stayed here several days, getting into the slow uneventful grove, taking time and enjoying the place. 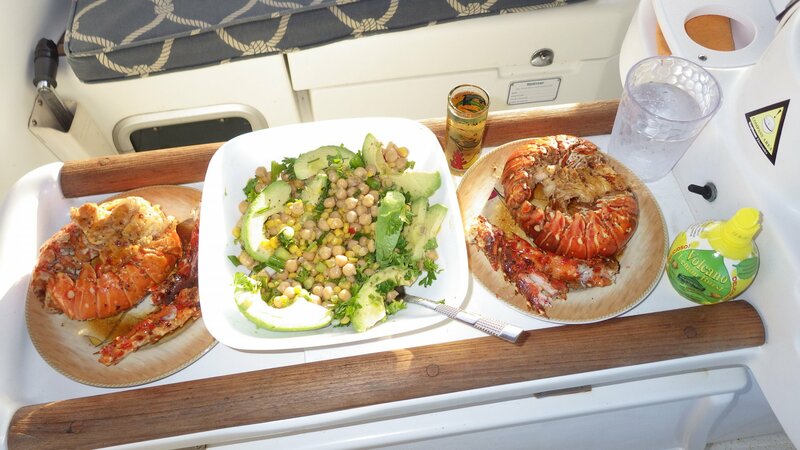 Had a chance to buy fresh lobsters from the local fisherman � delicious. 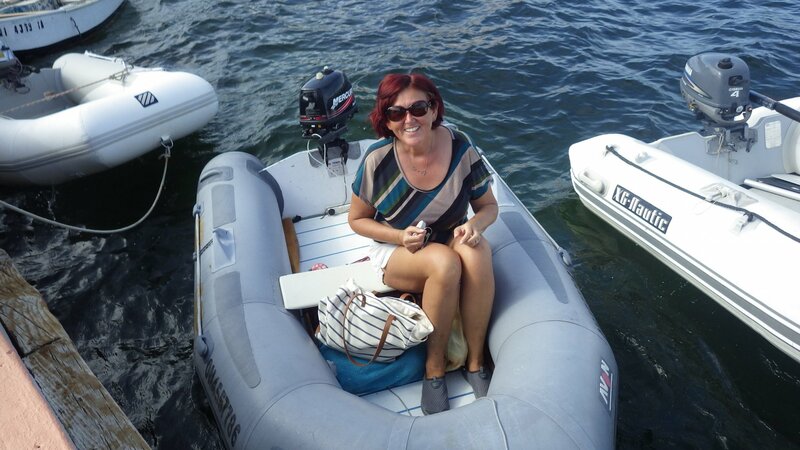 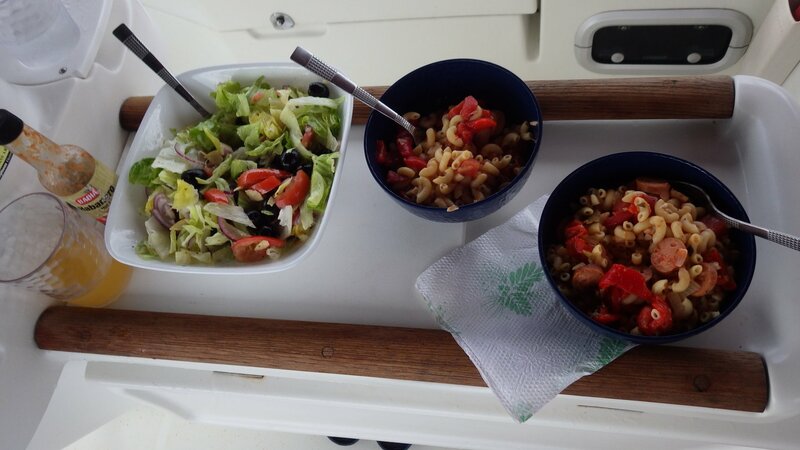 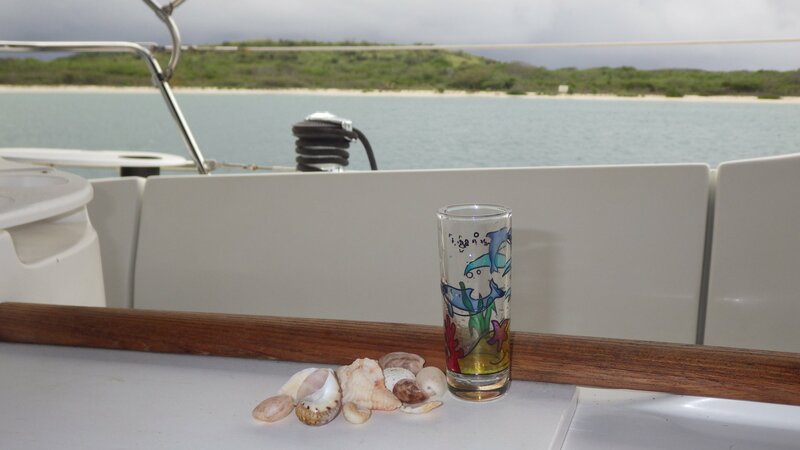 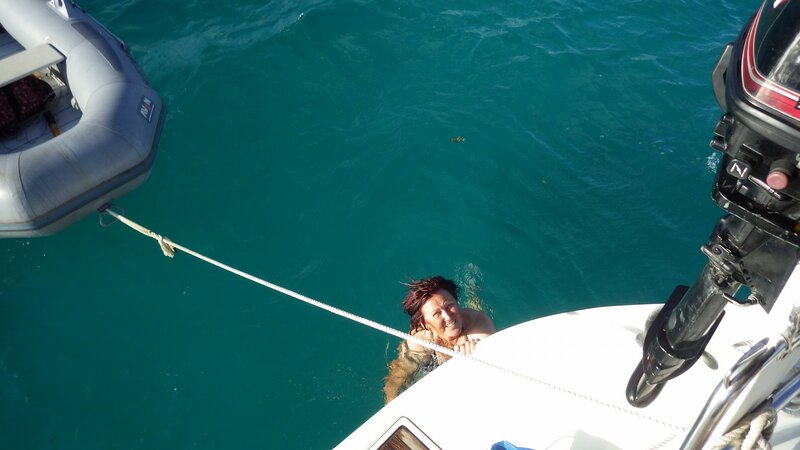 The only thing I wasn't enjoying, there is no dock where to fill the yacht�s water tanks, so if you stay long enough (and do not have a desalinator/watermaker) you have to get water by jugs in a dingy, at $0.25 per gallon. 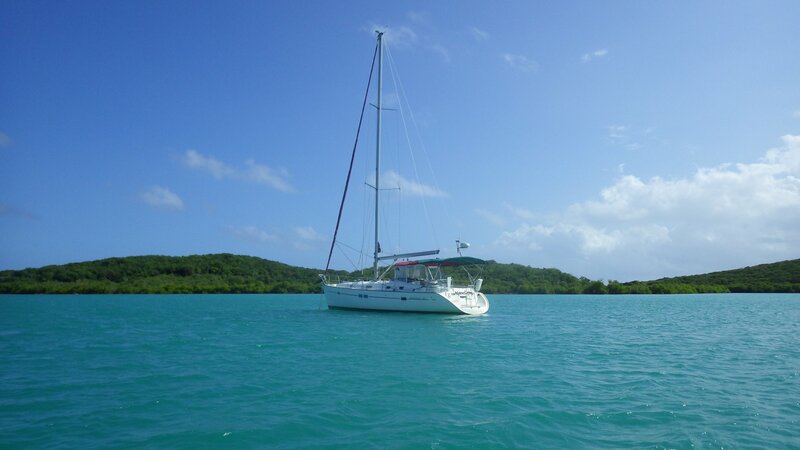 I have read about this anchorage in cruising guides as one of the finest. 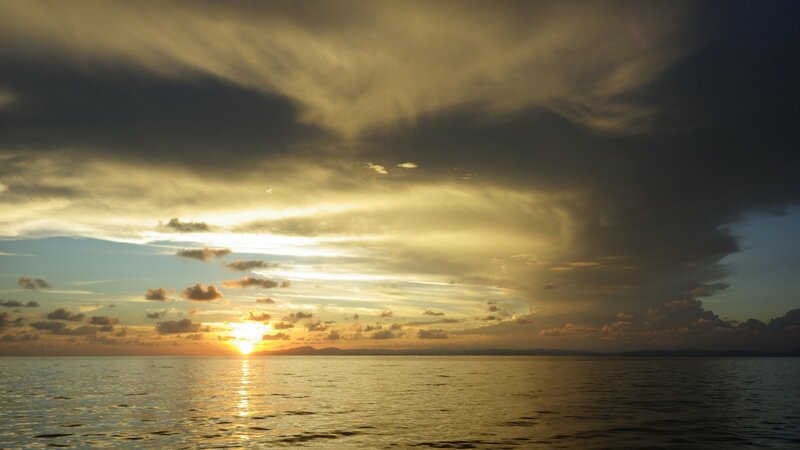 It is special indeed. 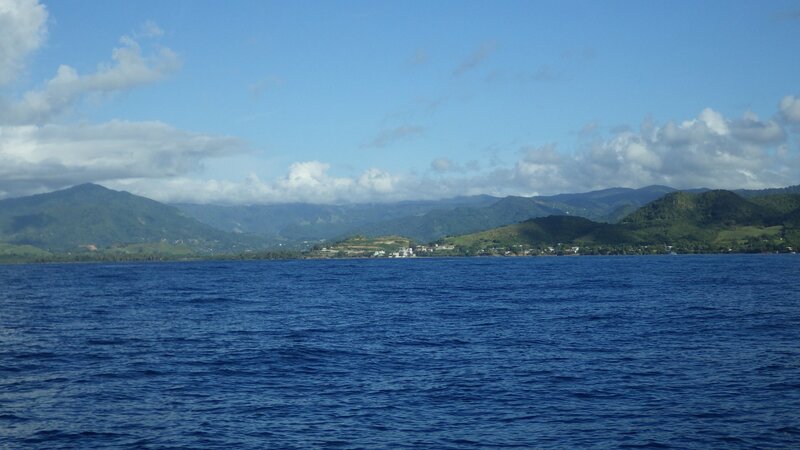 On one side, you see lush mountains with some houses sprinkled on. 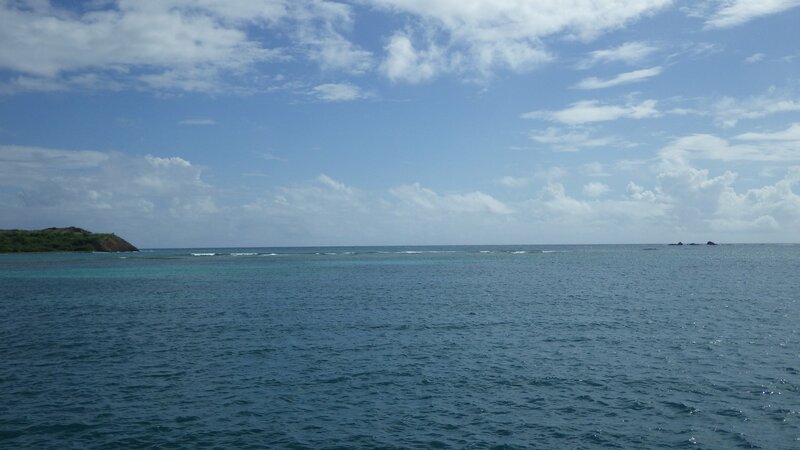 On the other side, the breaker reef shields the place from the waves and swell, hiding behind a pool of calm water with cooling trade winds blowing over the reef out of a clear horizon. 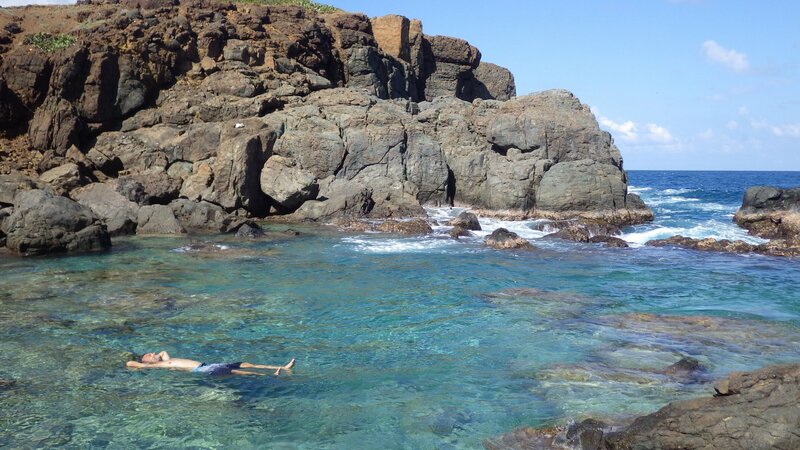 Sort of like the infinity pool effect. 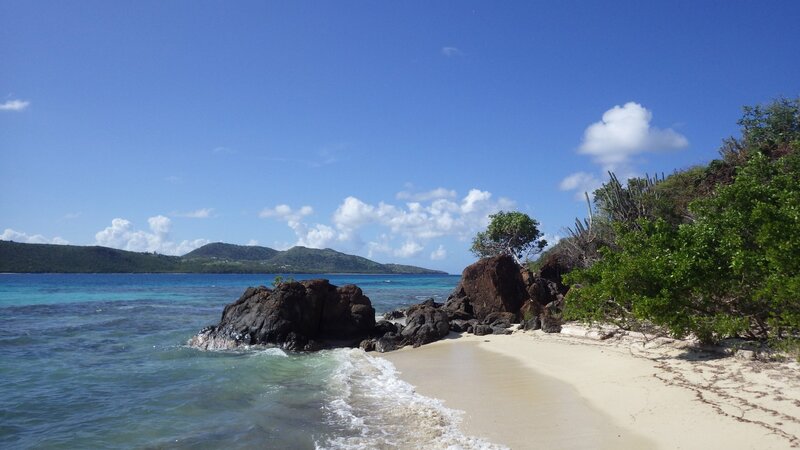 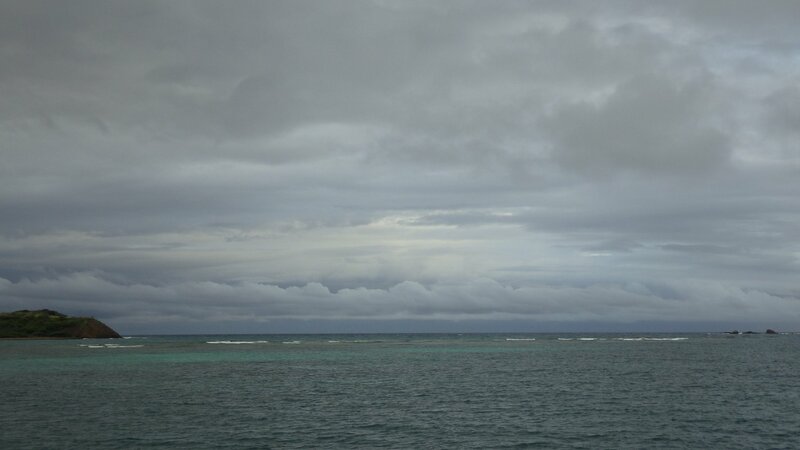 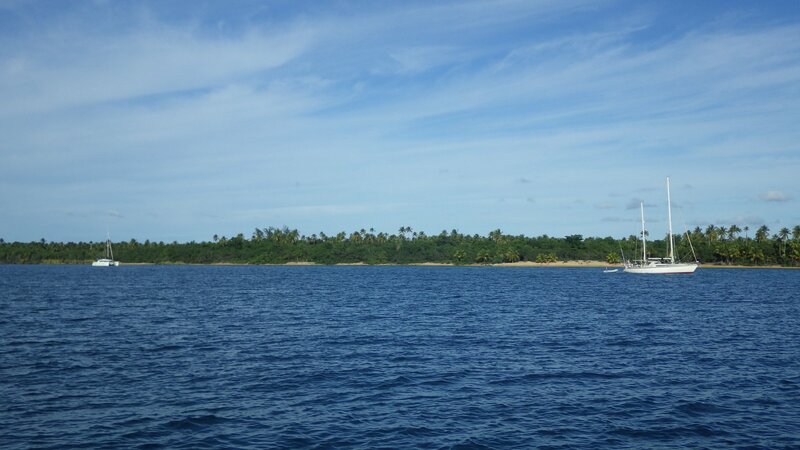 We stayed here for one day, swimming and walking along the shallow reef. 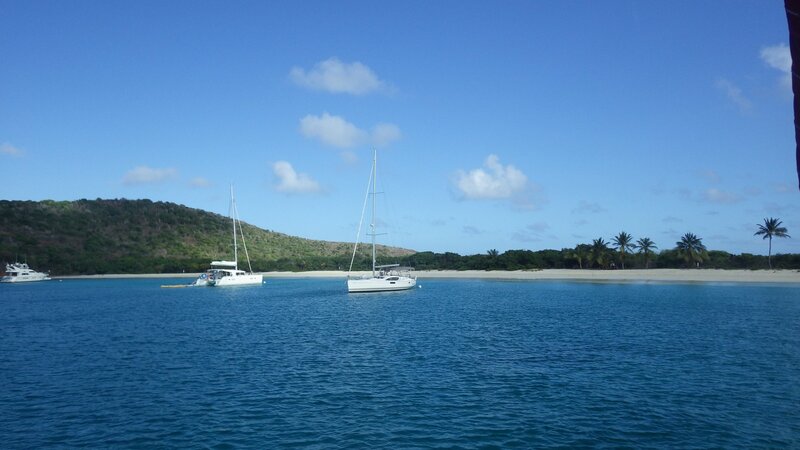 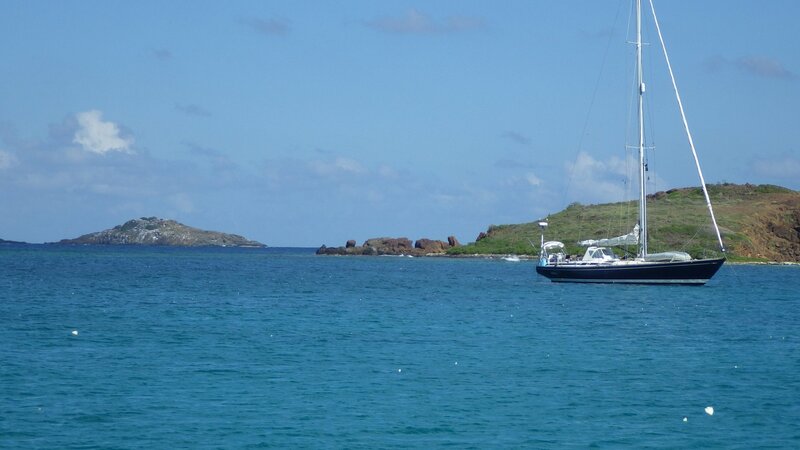 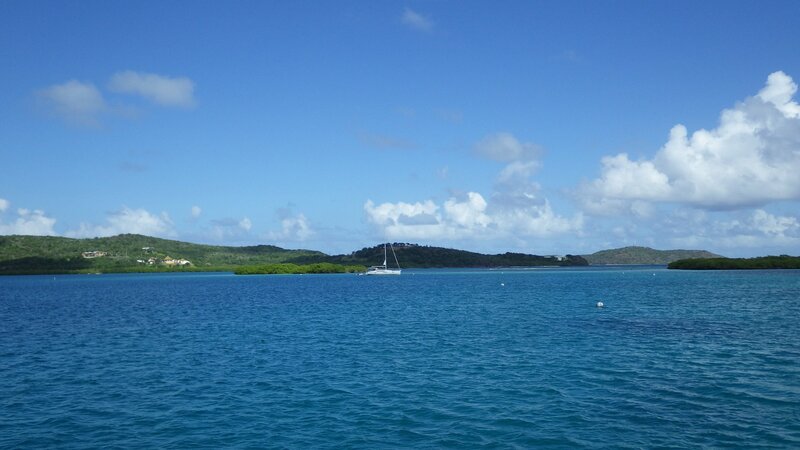 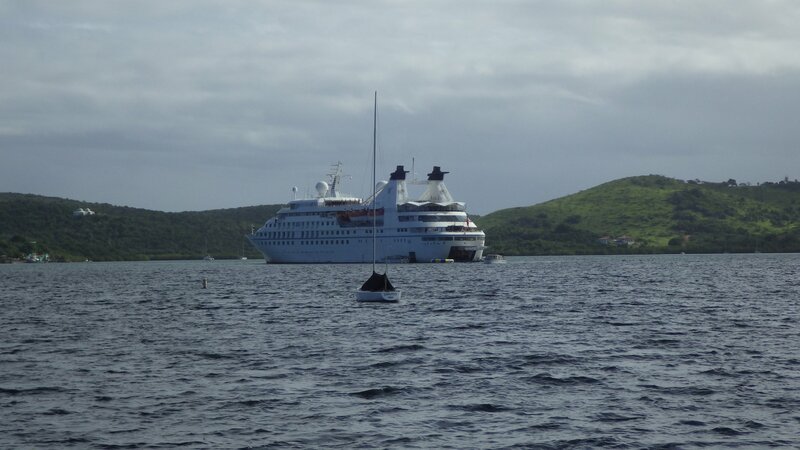 We anchored here on the South West side of the Culebrita Island hoping to stay overnight. 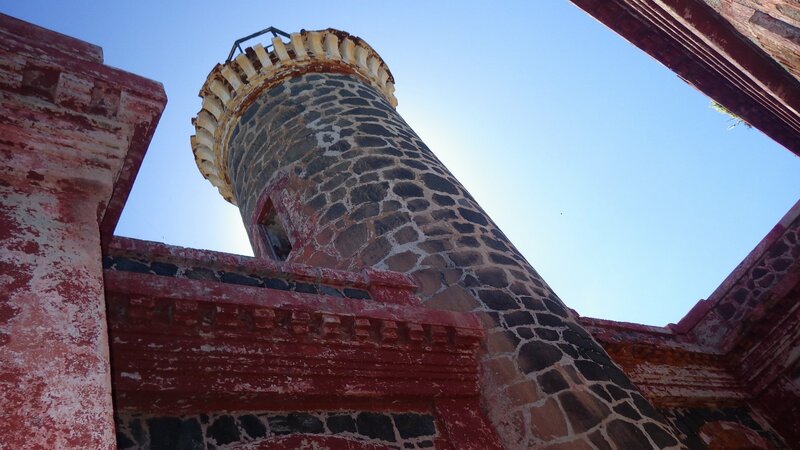 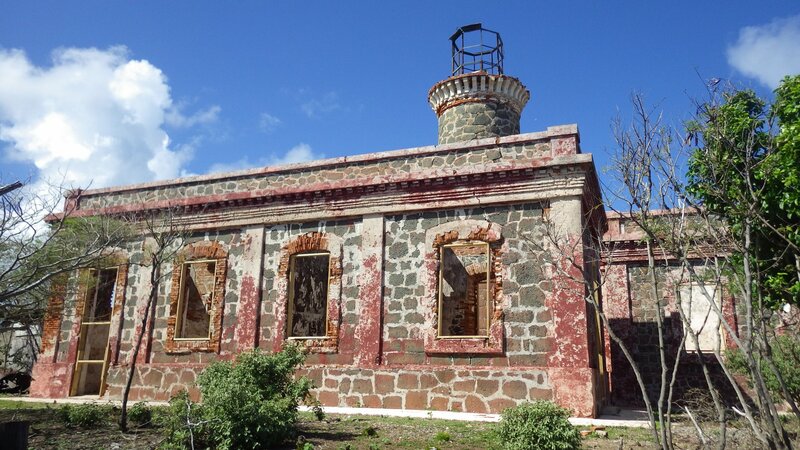 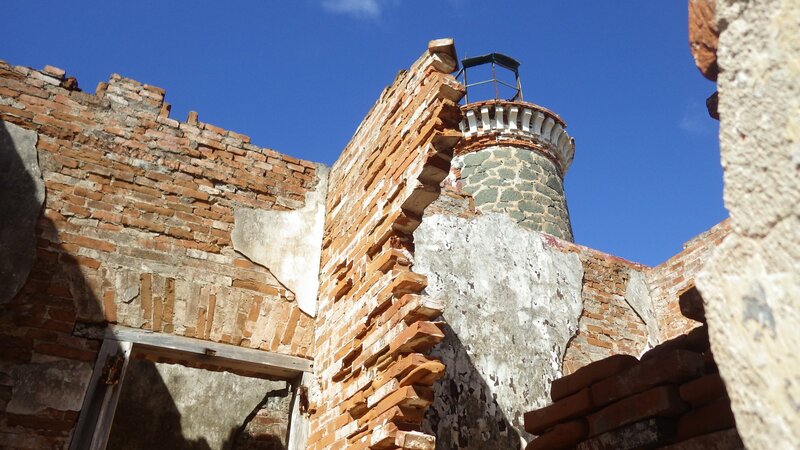 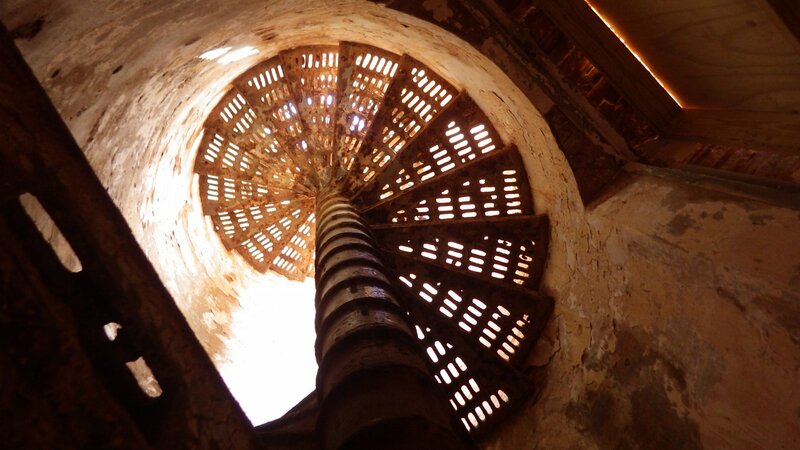 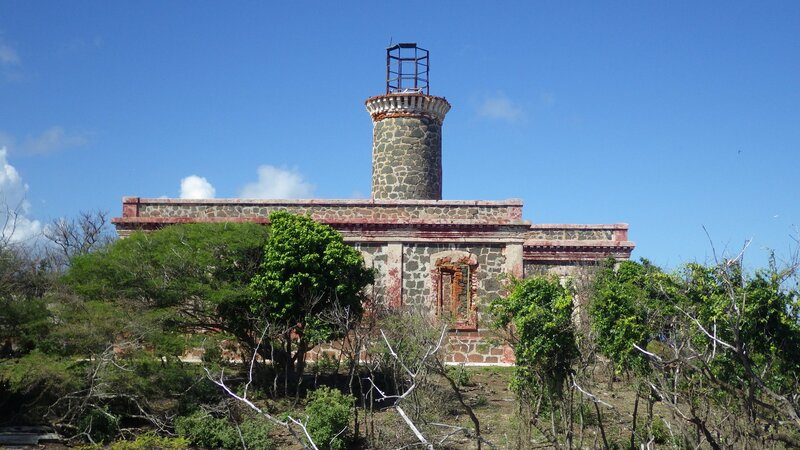 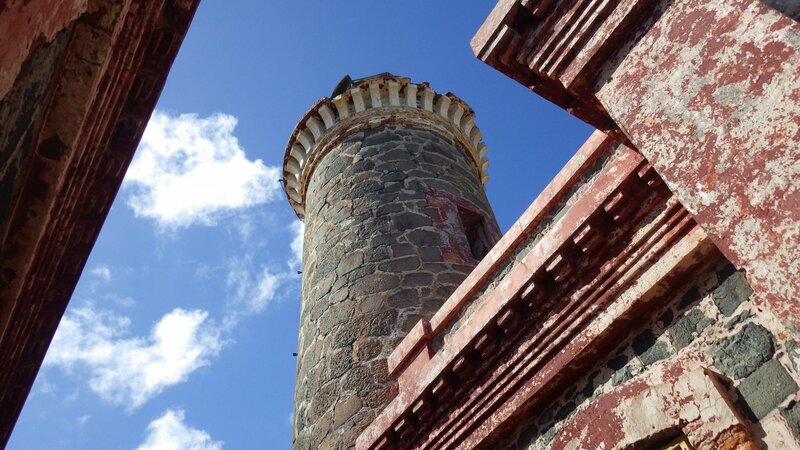 Had a refreshing hike uphill to see the remains of the oldest Spanish-built lighthouse in this hemisphere. 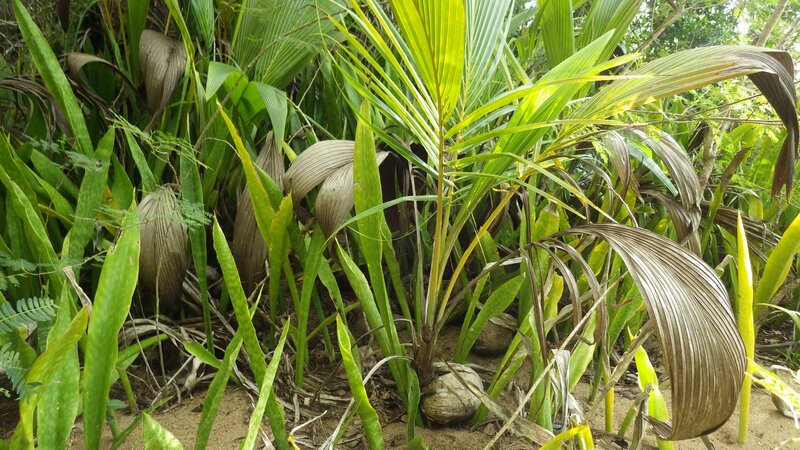 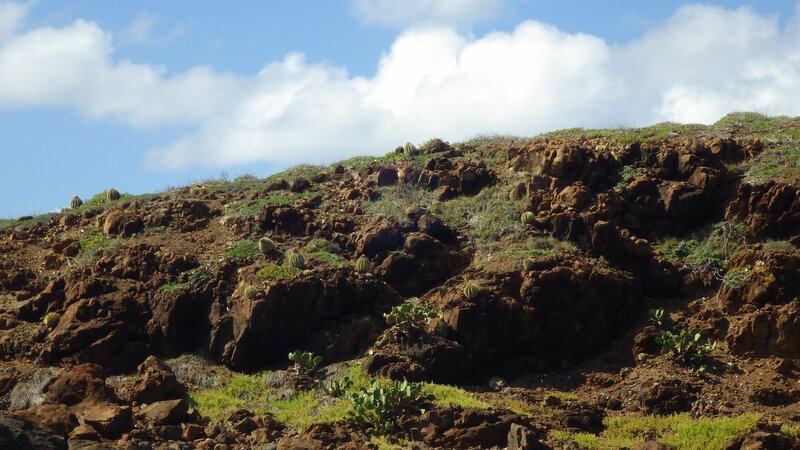 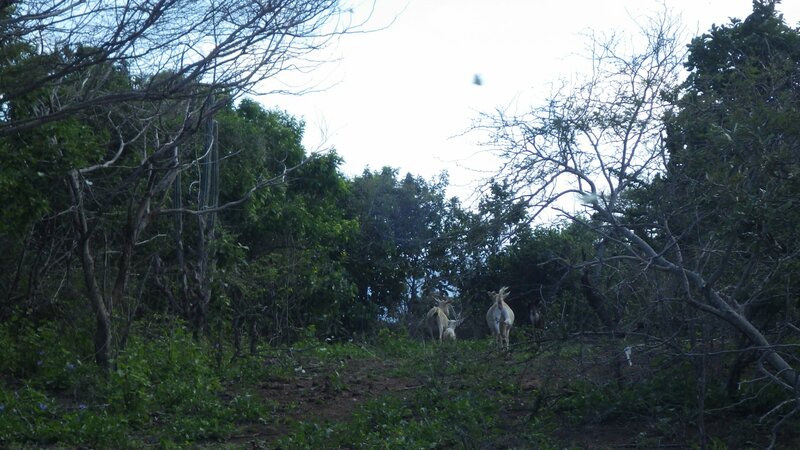 Wild goats roam the island, lots of mosquitoes, and hermit crabs provided entertainment along the path. 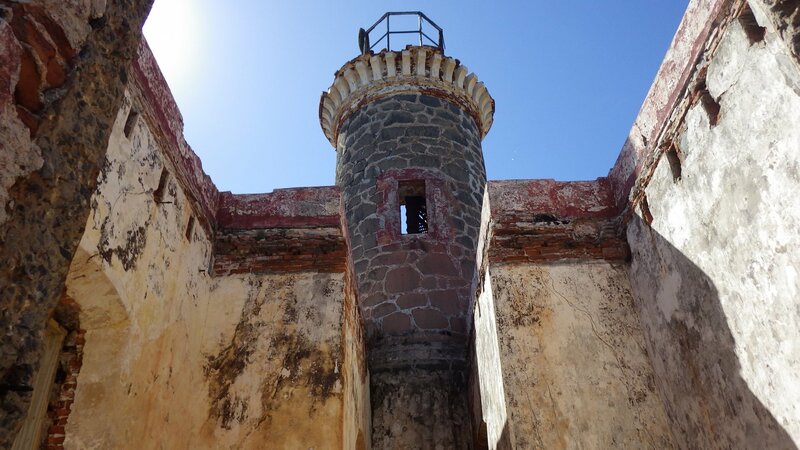 The old lighthouse still has the feeling as it's seen a lot in its time � hurricanes, sailing ships, battles, and beautiful all around views. 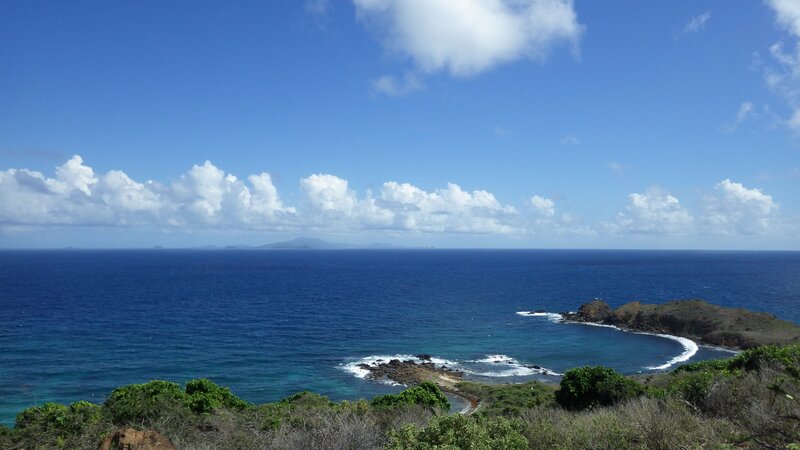 From the top, you can see Puerto Rico, Vieques and Culebra islands to the West, and St. Thomas US Virgin Islands to the East. 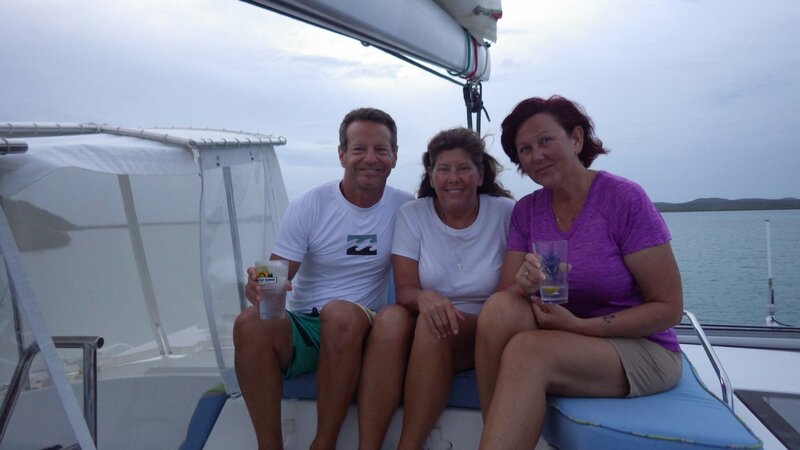 Unfortunately, there was a southern swell coming into the anchorage, making it a rolly and uncomfortable place. 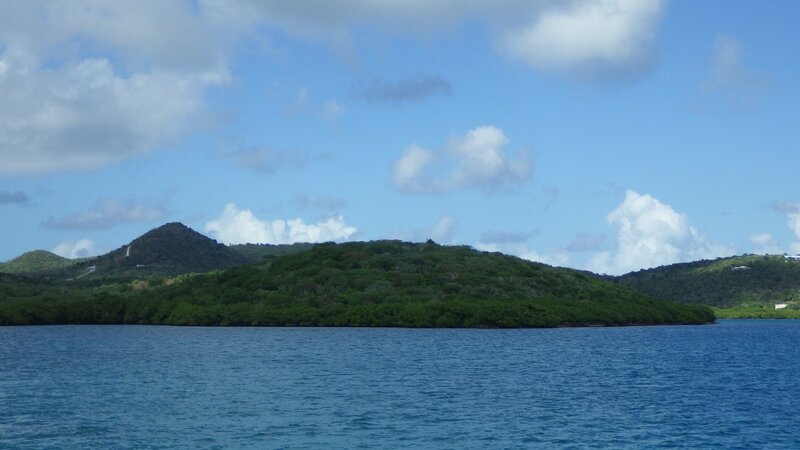 So we picked up the anchor and moved around the island to our next resting spot. 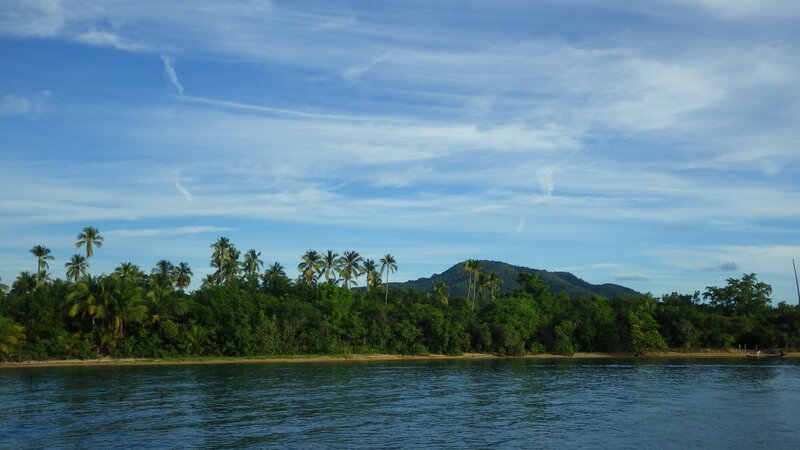 This is one of the prettiest beaches we have visited on our journey so far - white sand shore surrounded by coconut palm trees and mountains, calm and warm gin clear water, turtles swimming around the boat, wild goats seen on distant hills, and millions of white butterflies flying around like fluffy snow. 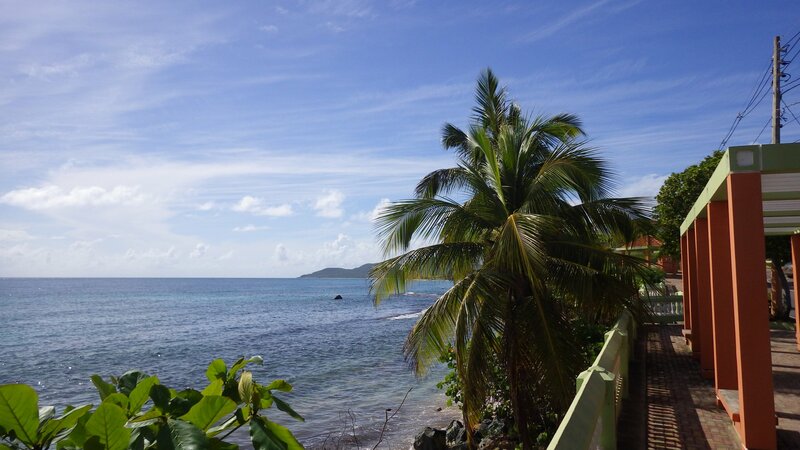 Quintessential Caribbean. 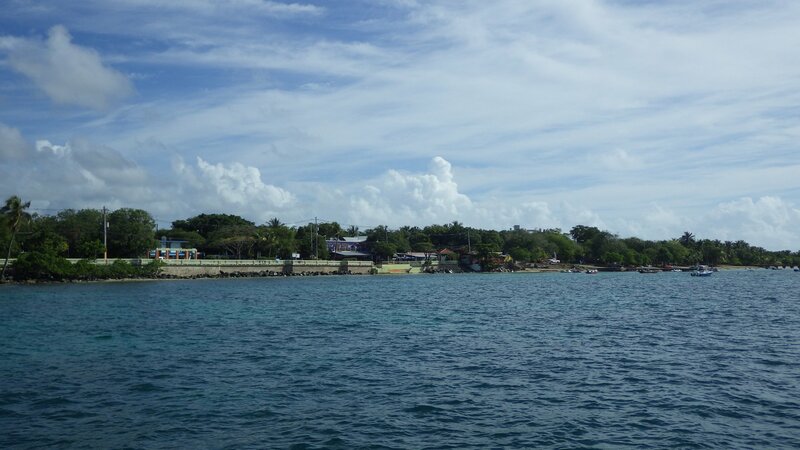 We stayed here couple days - swimming on the beach, snorkeling nearby reef, hiked along the shore around the cape to relax in "jacuzzis". 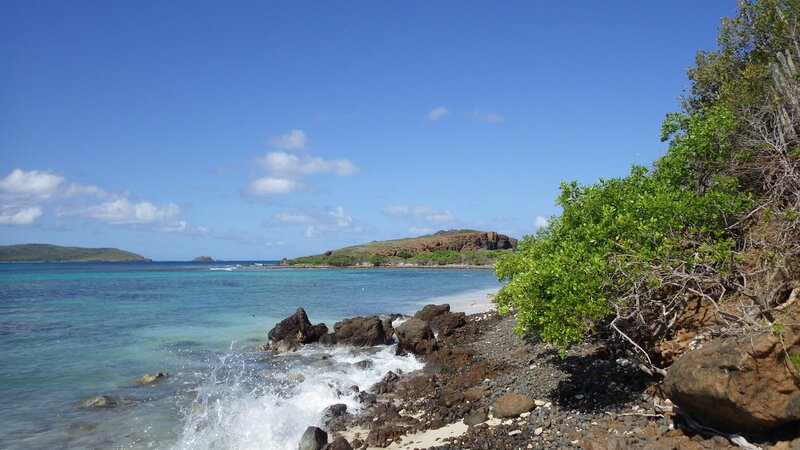 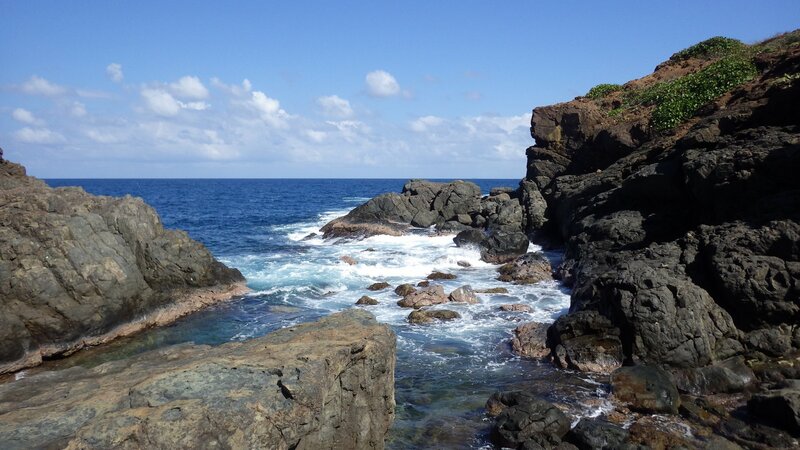 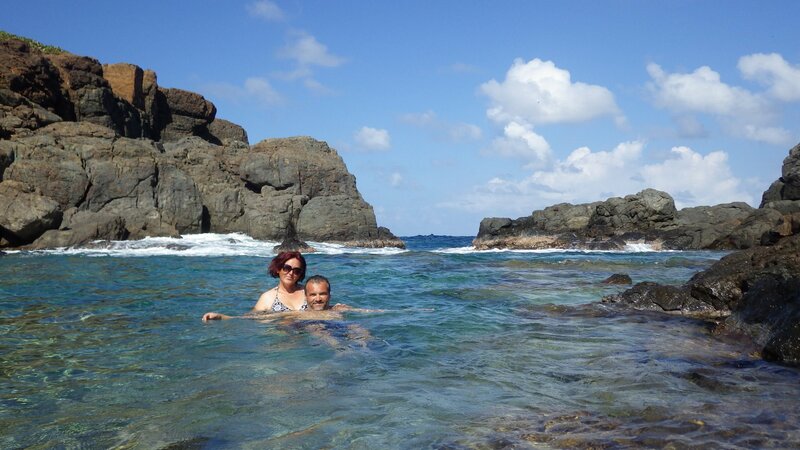 These are small coves on the windward side of the island where waves rush in creating pools of bubbly water, with small tropical fish around you. 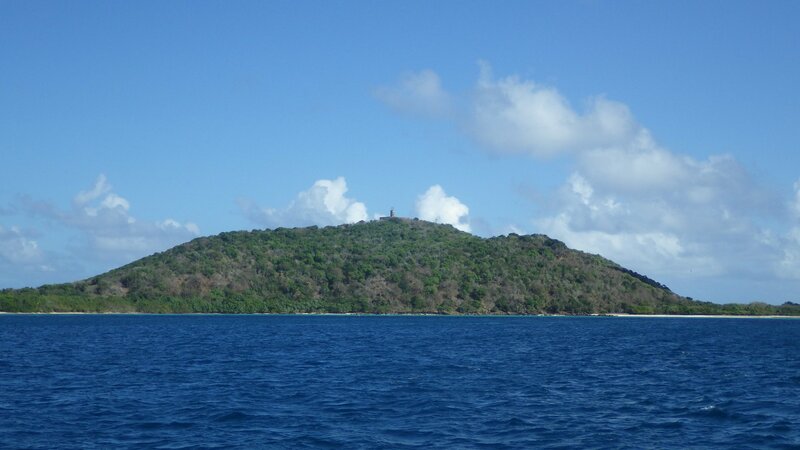 The Culebita Island is a natural reserve area, so there is no development here. 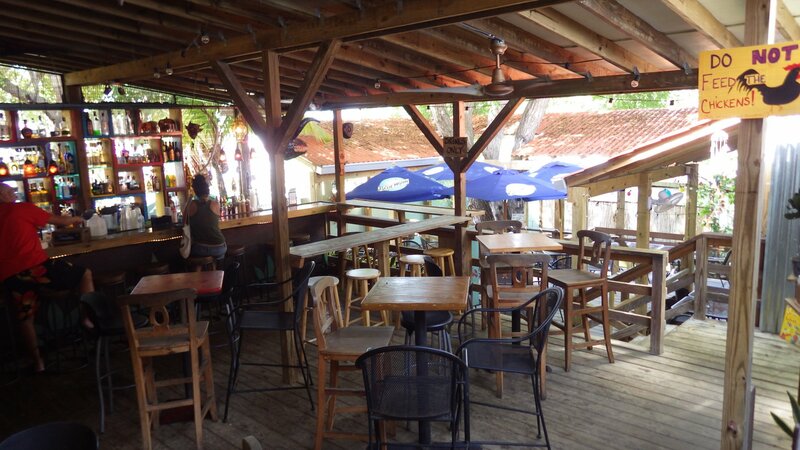 It is a fairly popular place, especially on the weekends. 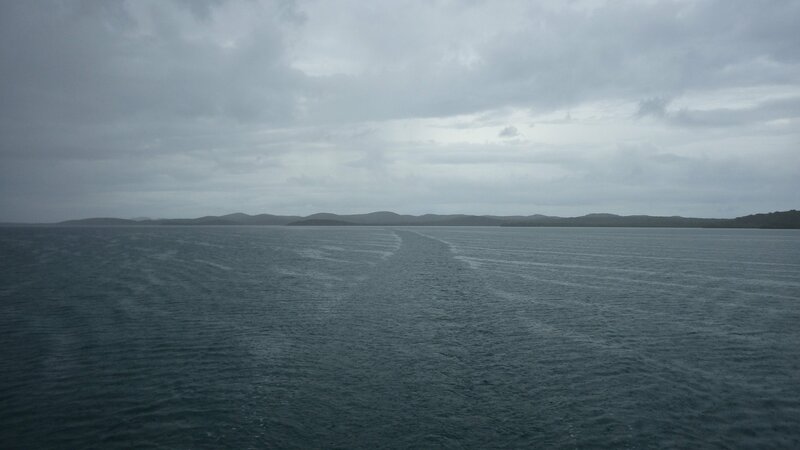 People come and go. 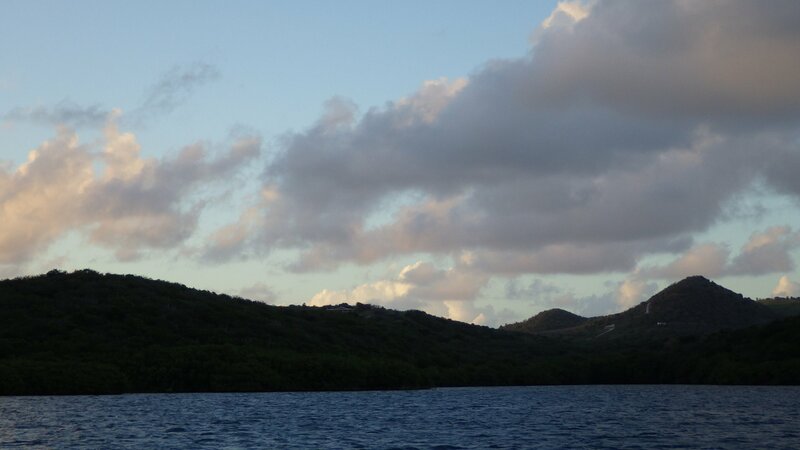 Also little buggy at sunset. 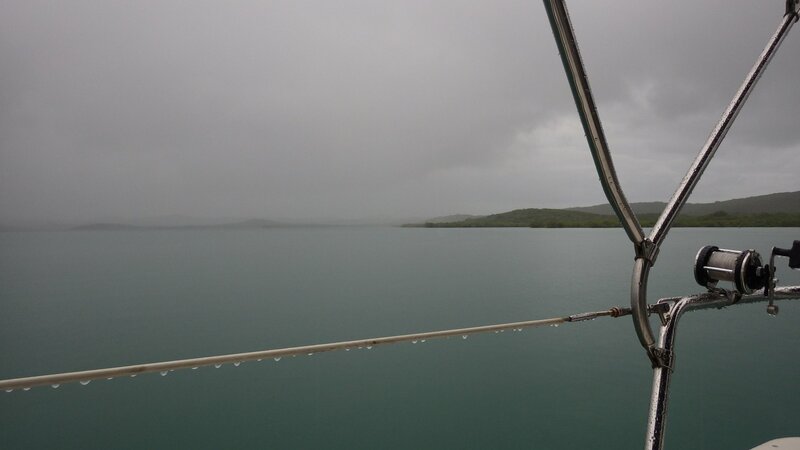 However this didn't stop us from having a great time.